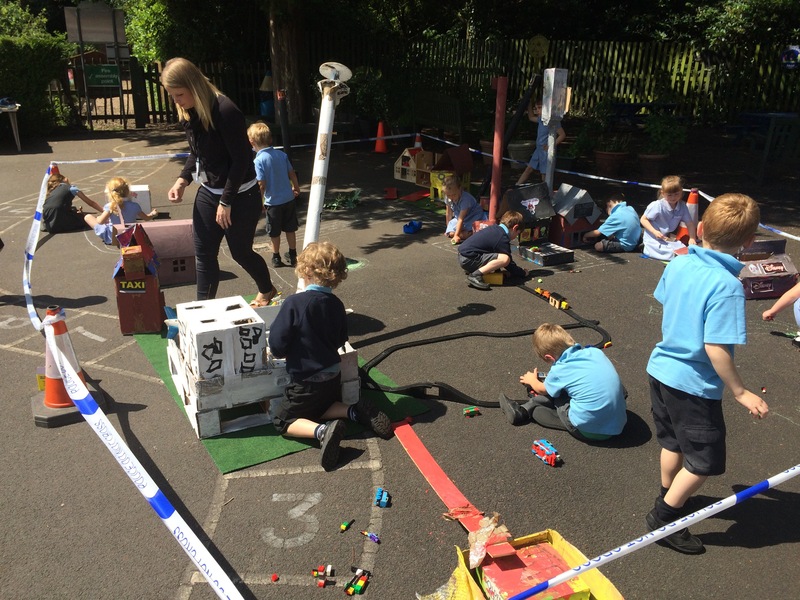 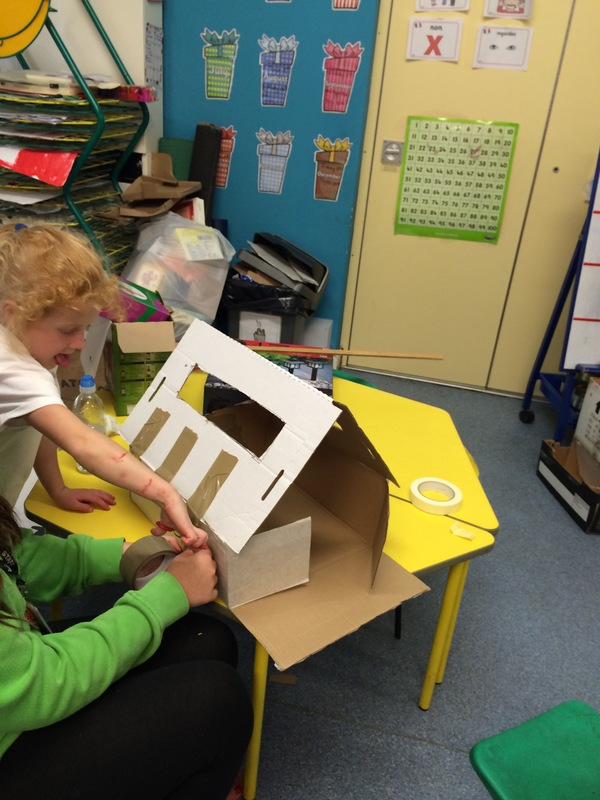 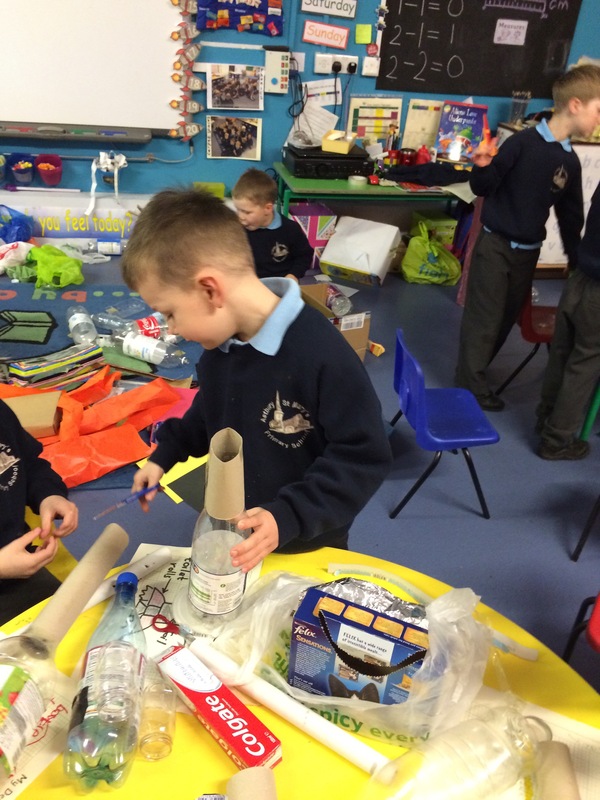 3D Shapes and junk modelling materials. 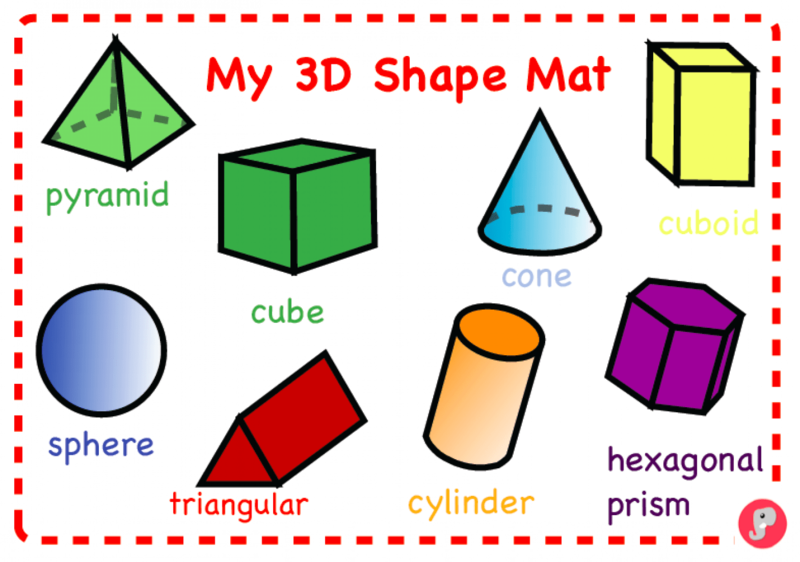 As part of our maths for next week we will be starting to learn about 3D shapes their properties and their names. 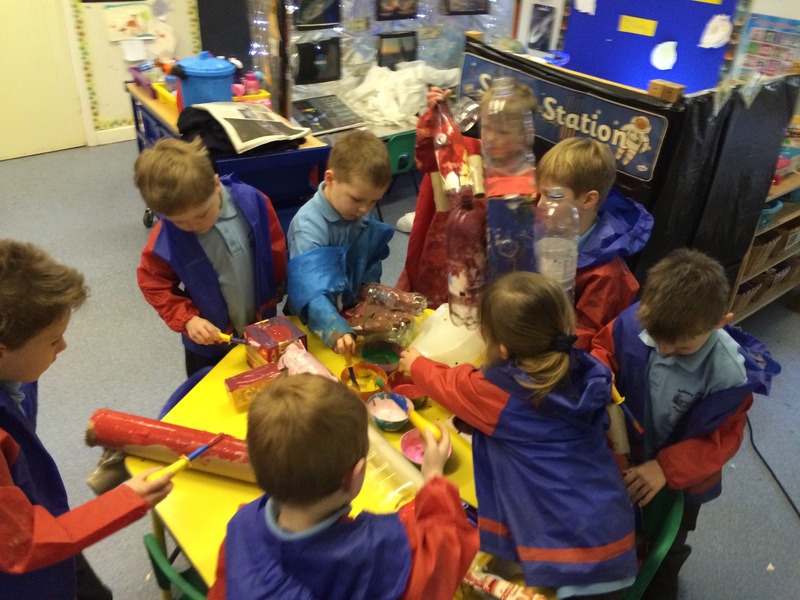 We will be making 3D models, this time our models will be Christmas themed. 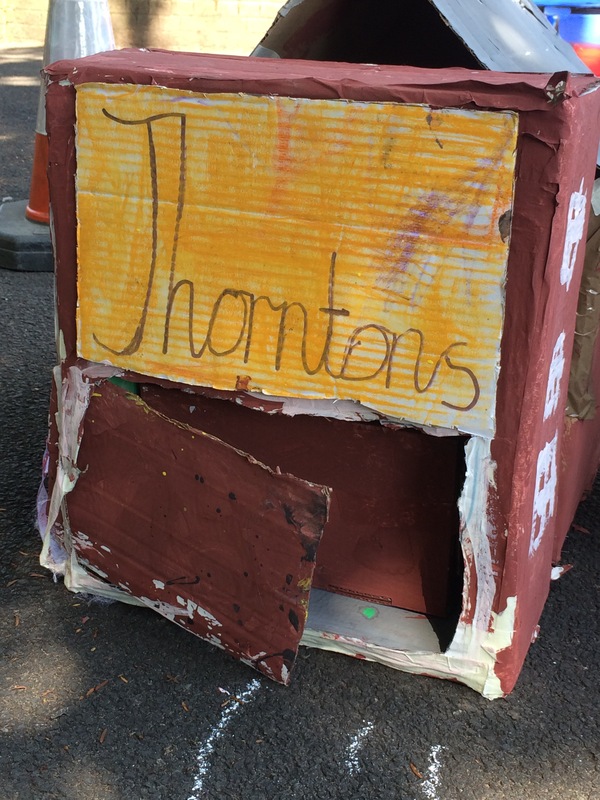 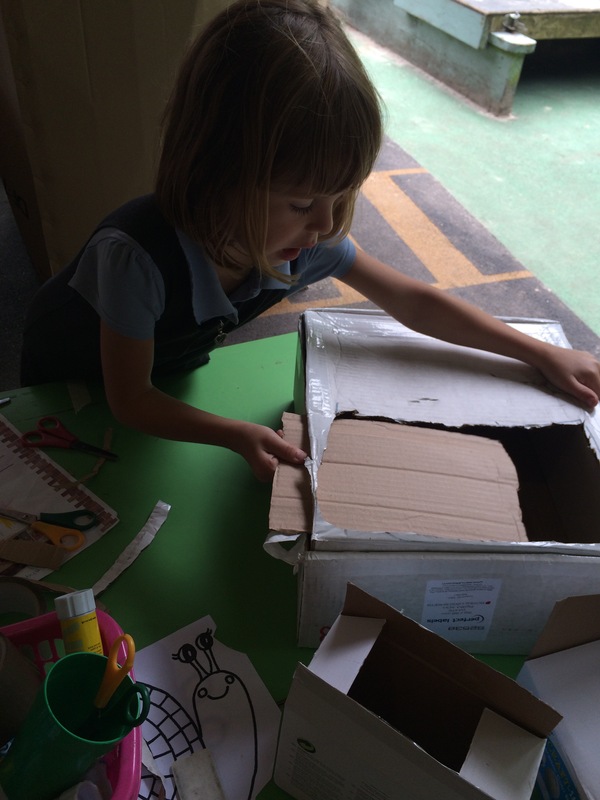 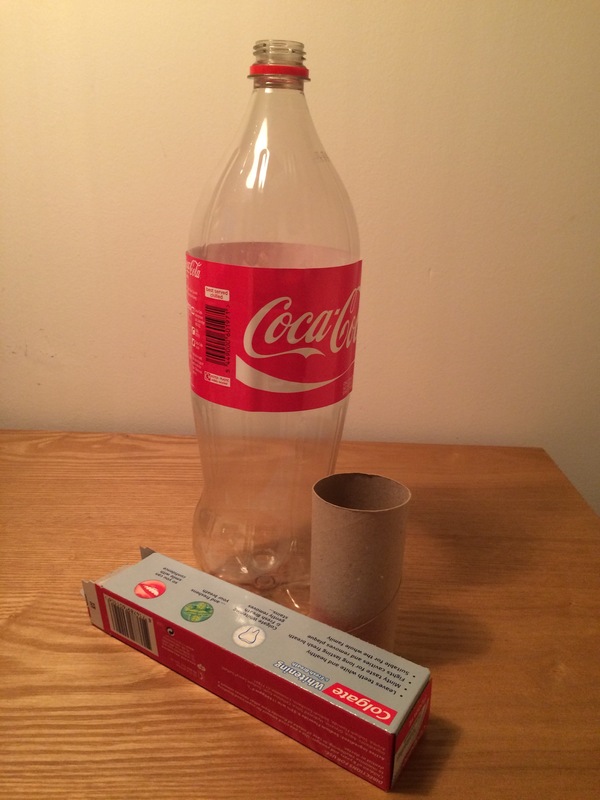 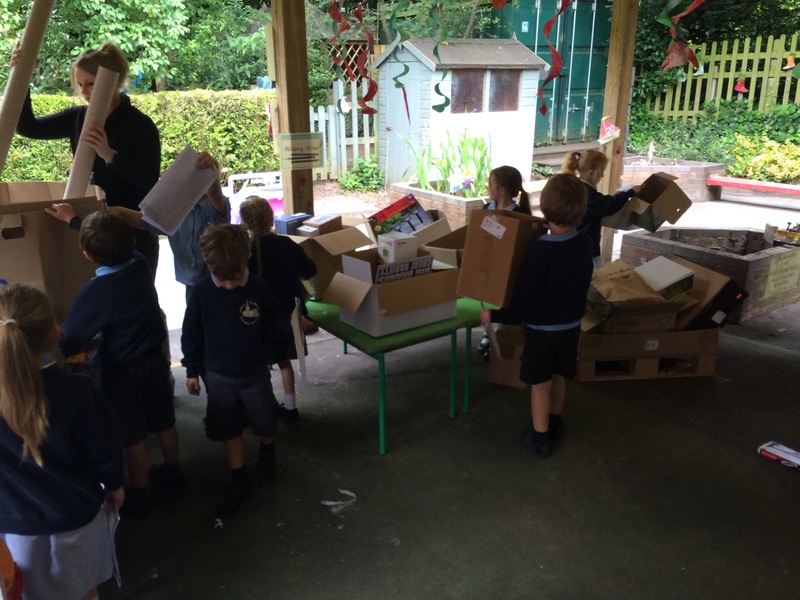 Please can you save your toilet roles and boxes from your recycling and bring them in next week. 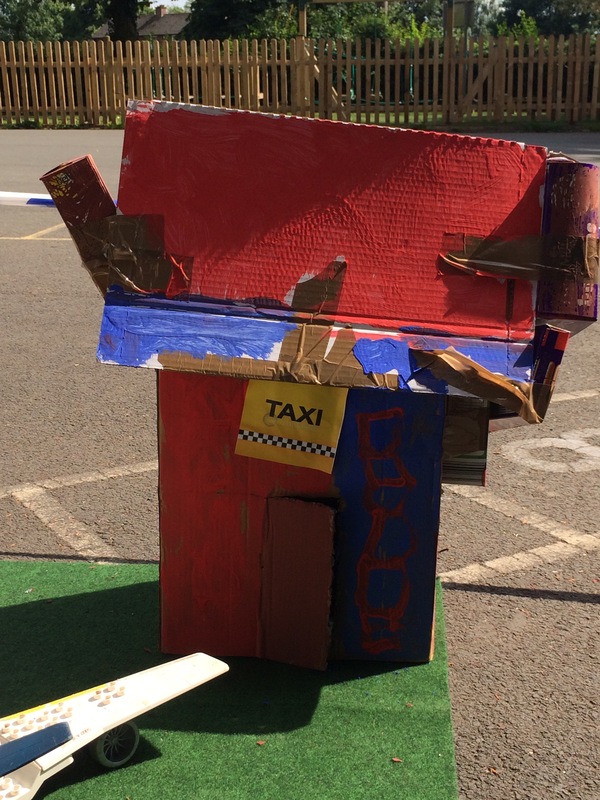 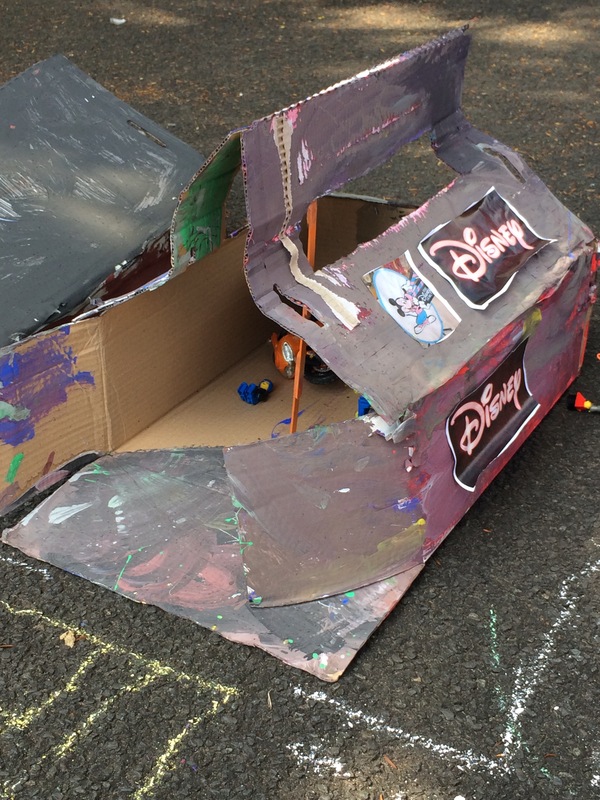 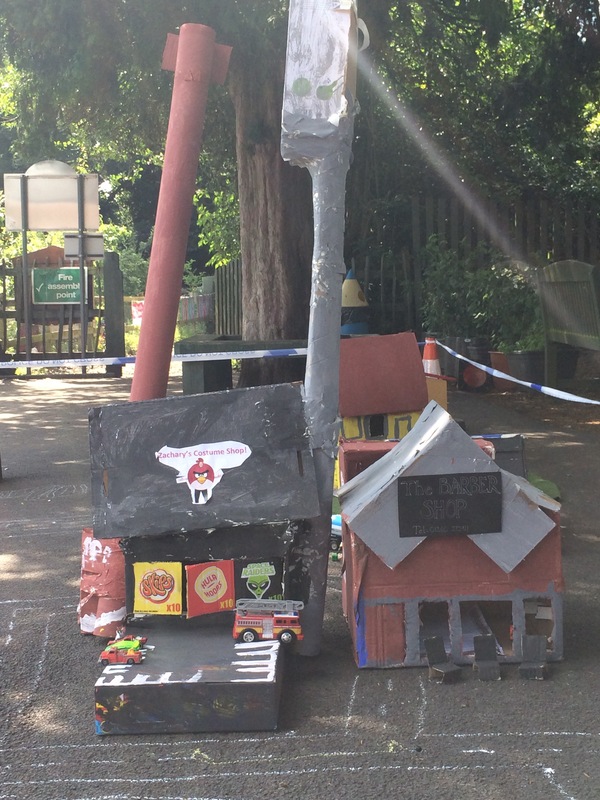 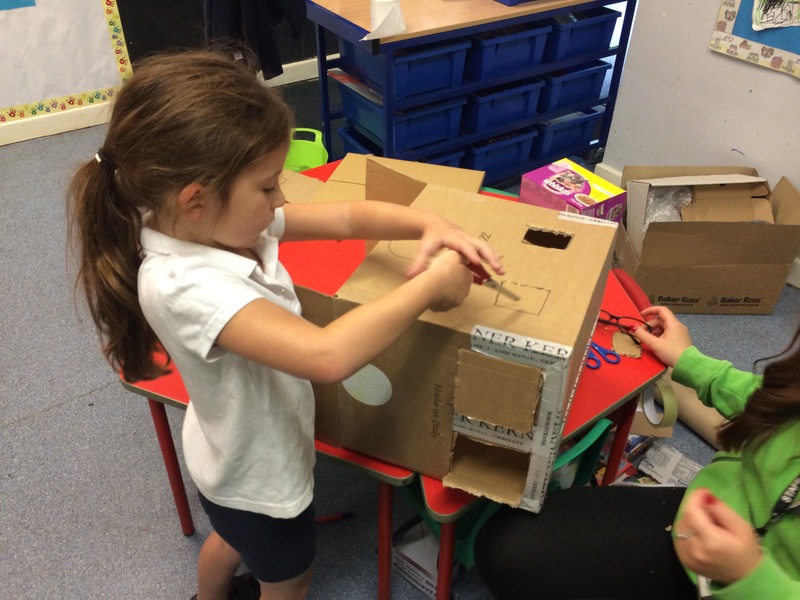 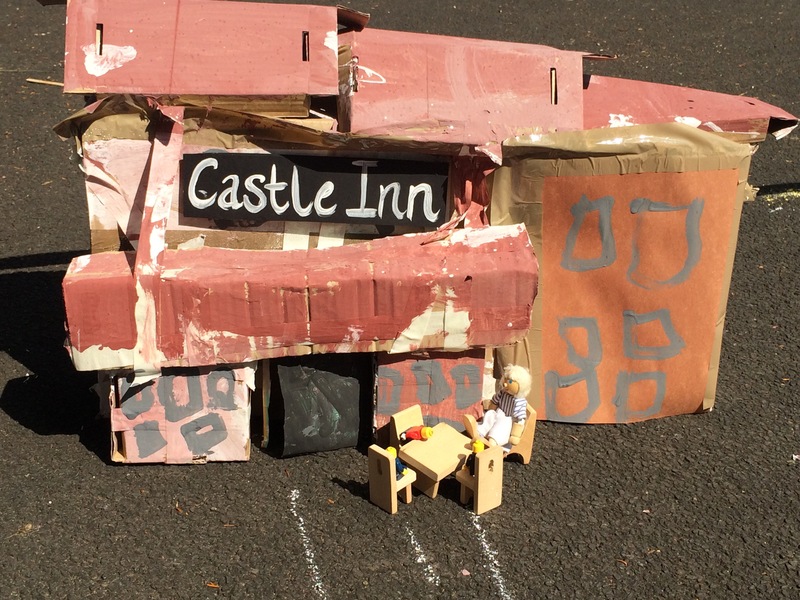 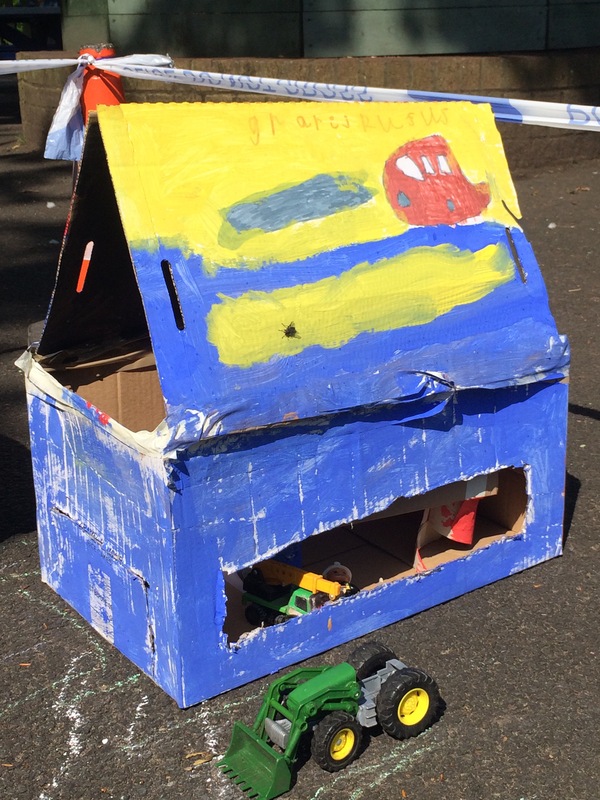 If there are any family members who are free on Tuesday 20th and Wednesday 21st to come and help us make and decorate our models that would be wonderful. 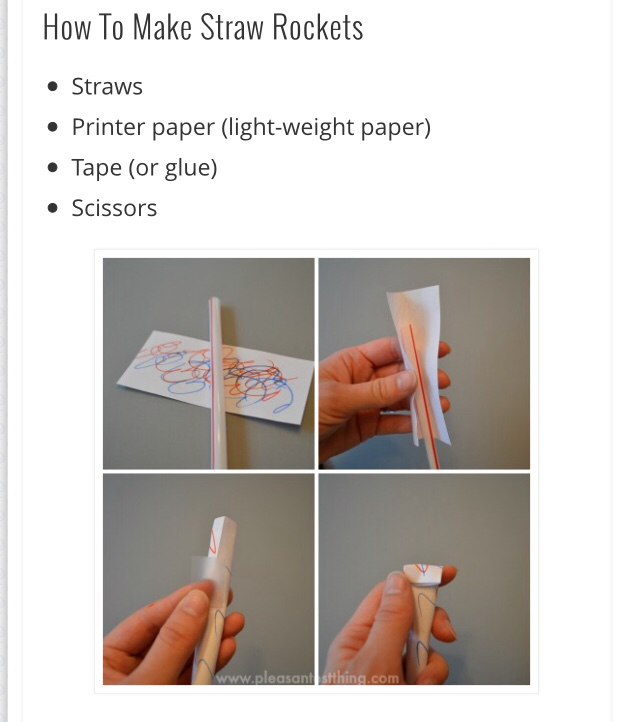 Please let me know if you can help. 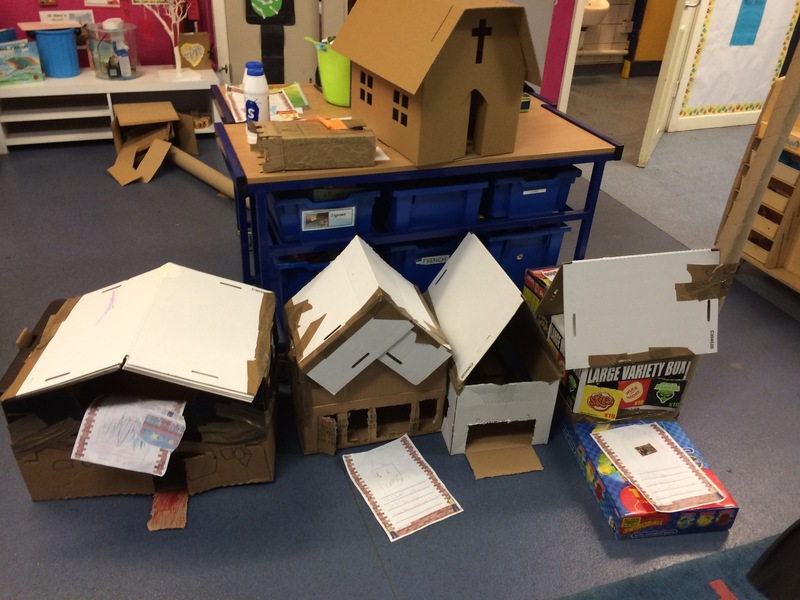 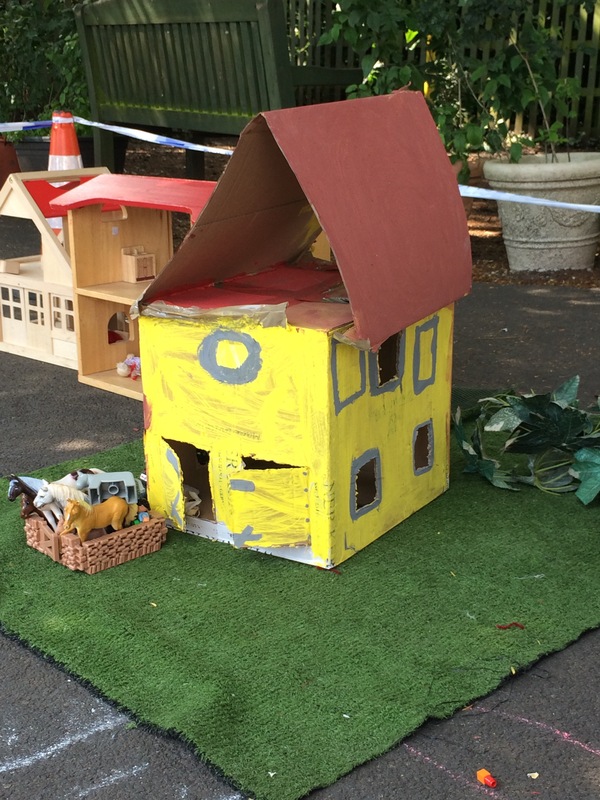 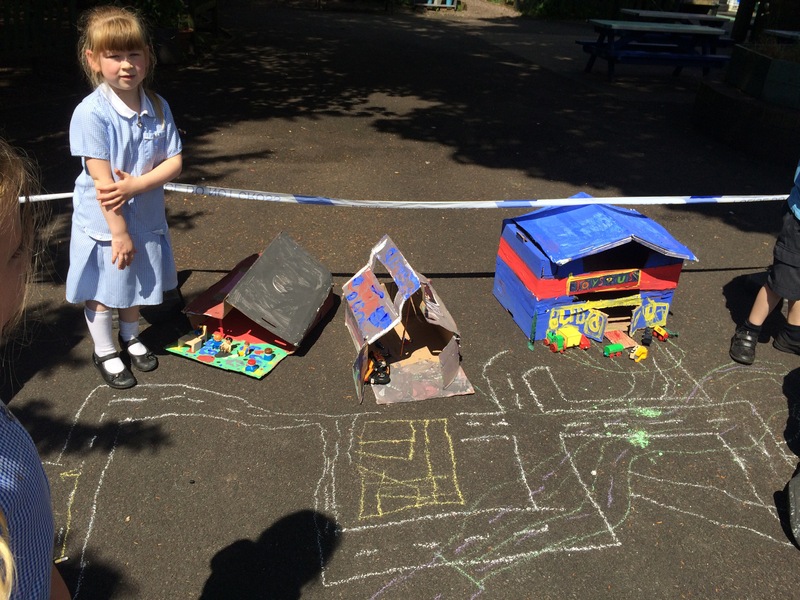 For our topic we have been leaning about different buildings. 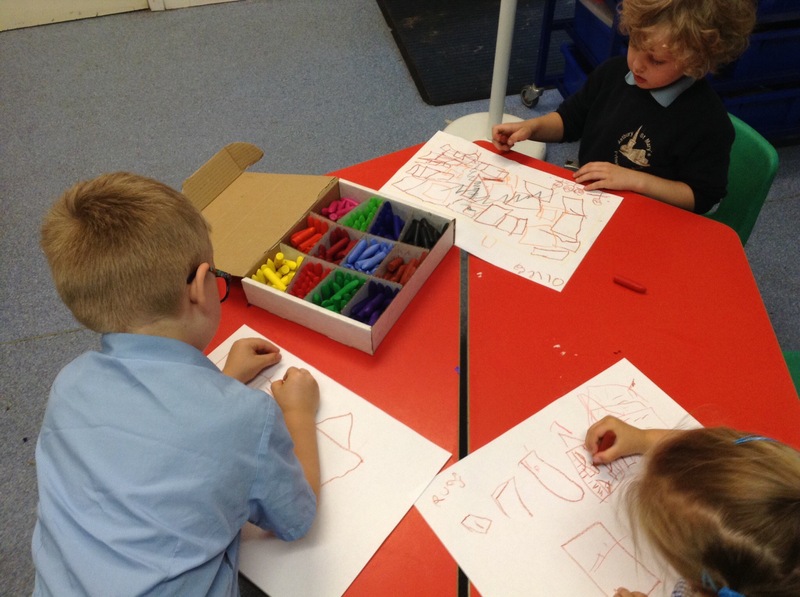 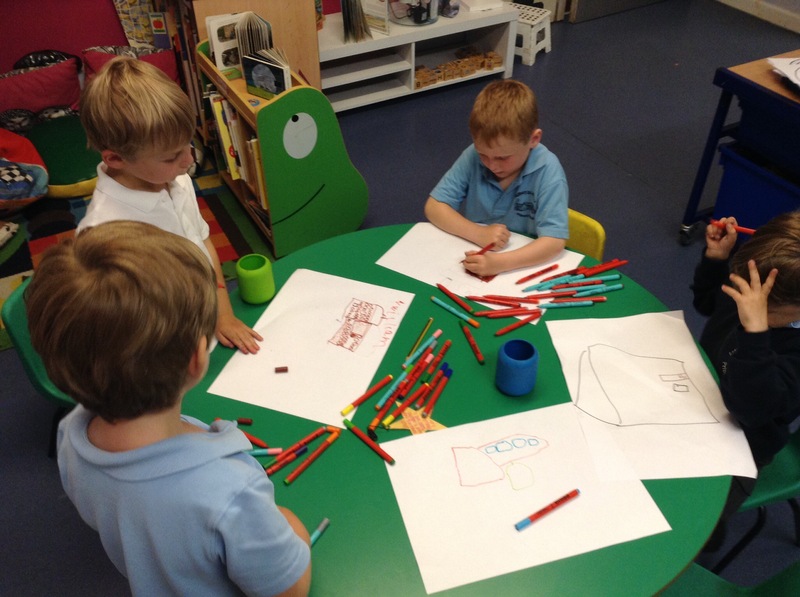 We learnt about different types of houses and had a lesson where we learnt to drawer our own houses. 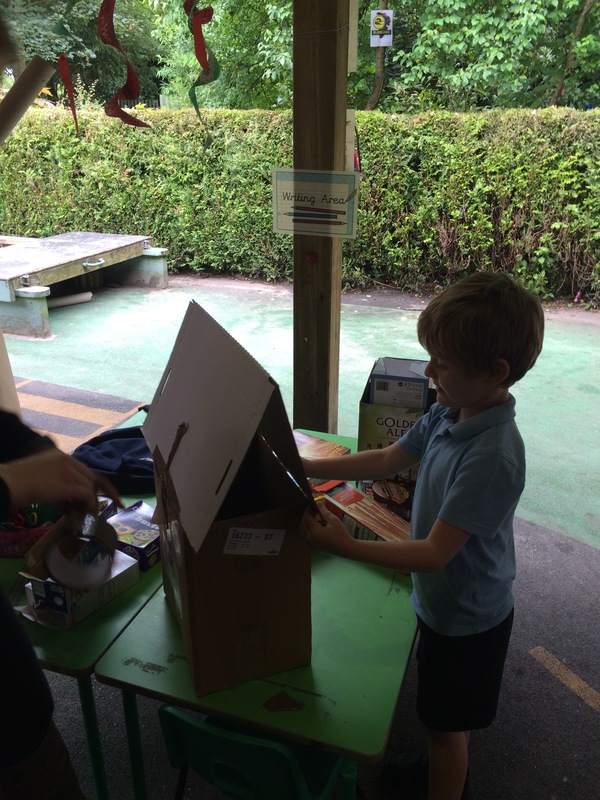 Then we learnt about different uses for buildings. 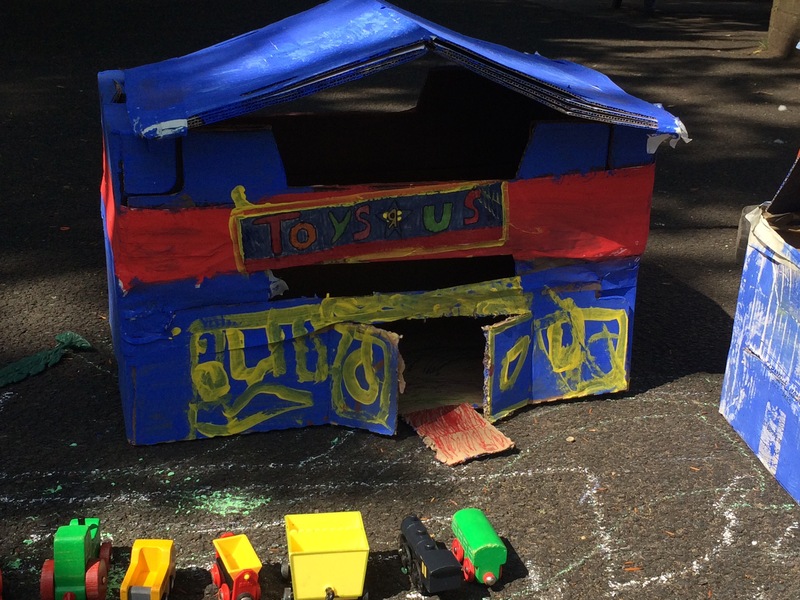 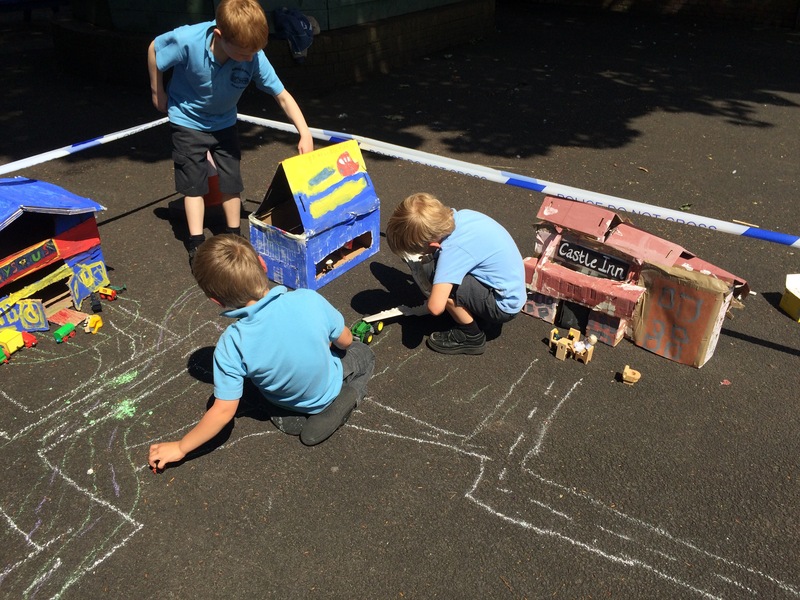 Some clever spark had a bright idea to build a town so that’s what we did! 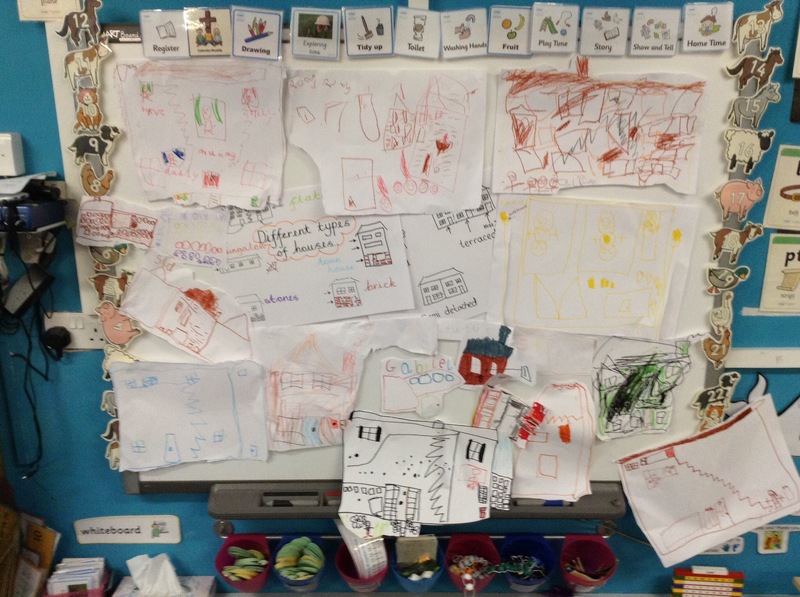 We planned out buildings to go in our towns. 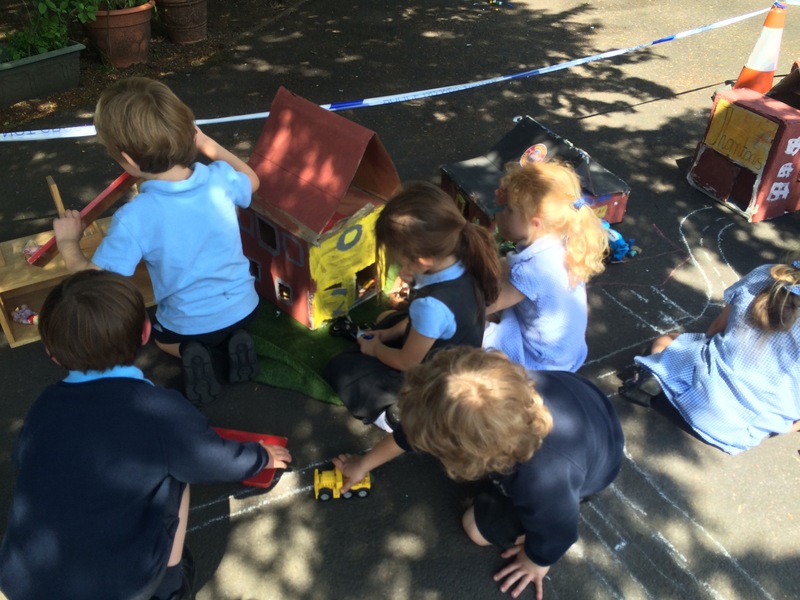 Everyone had to have a different building for a different use. 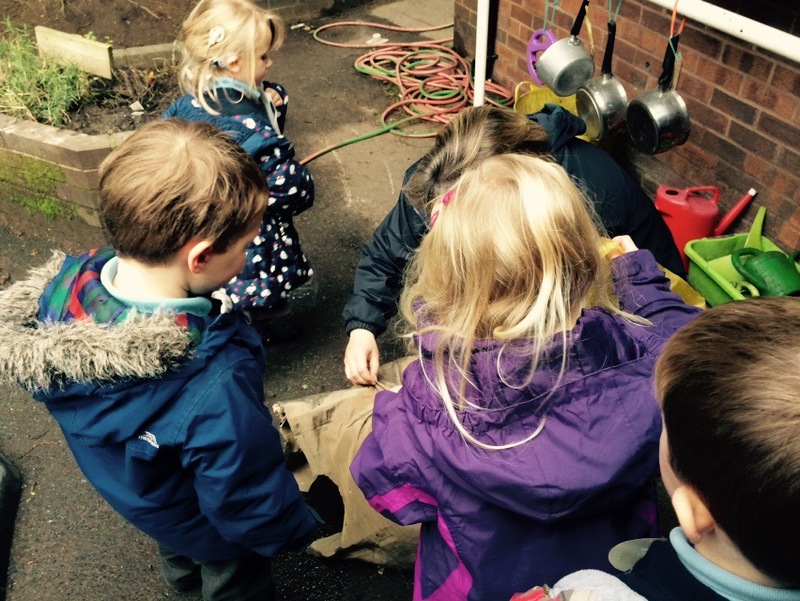 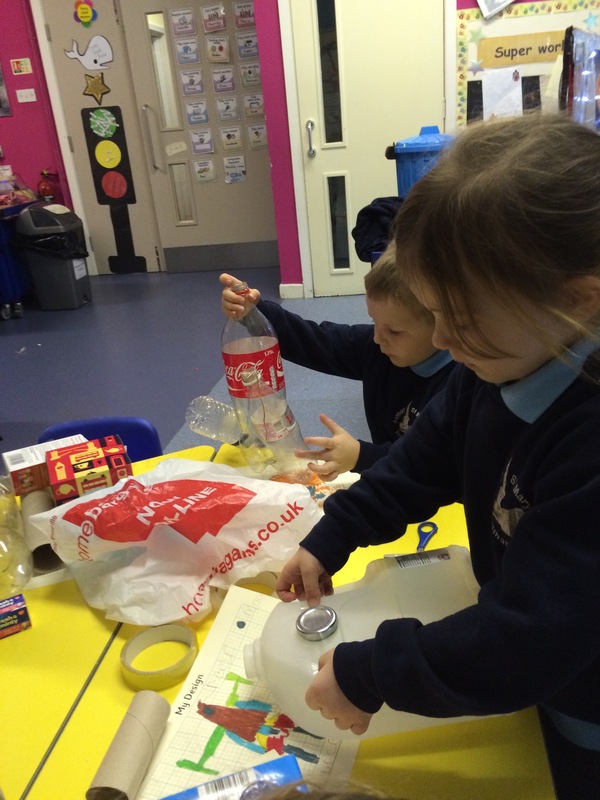 Then we collected our junk with help from our friends and families. 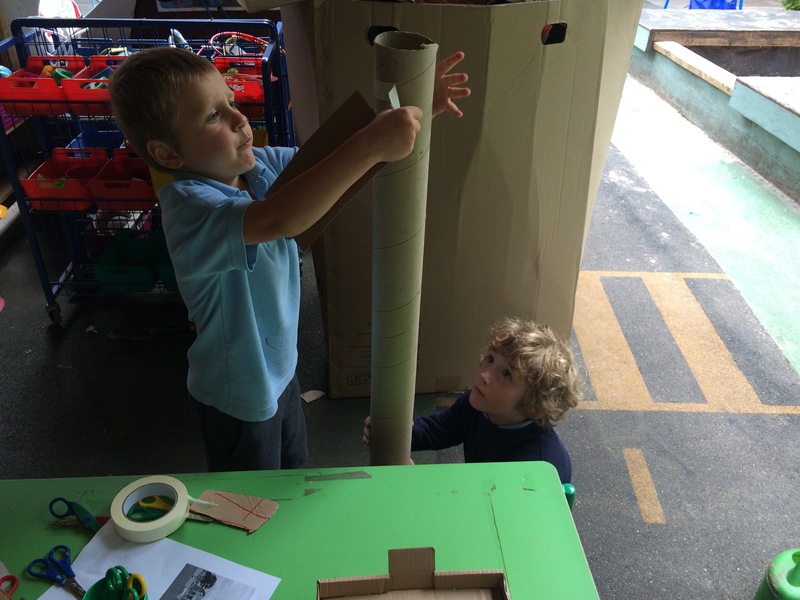 Using the boxes and tubes we made our buildings (with a little help from the odd adult and our buddies). 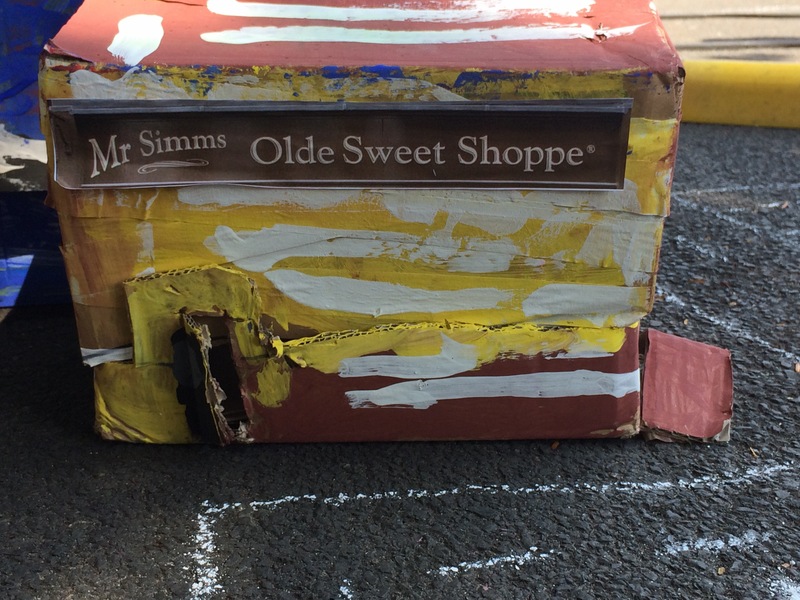 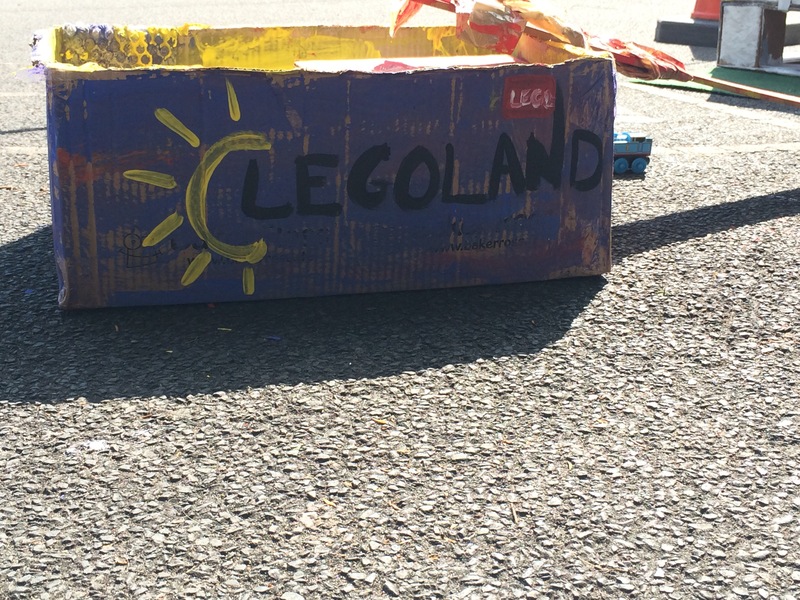 After they were constructed we painted them and added our final details. 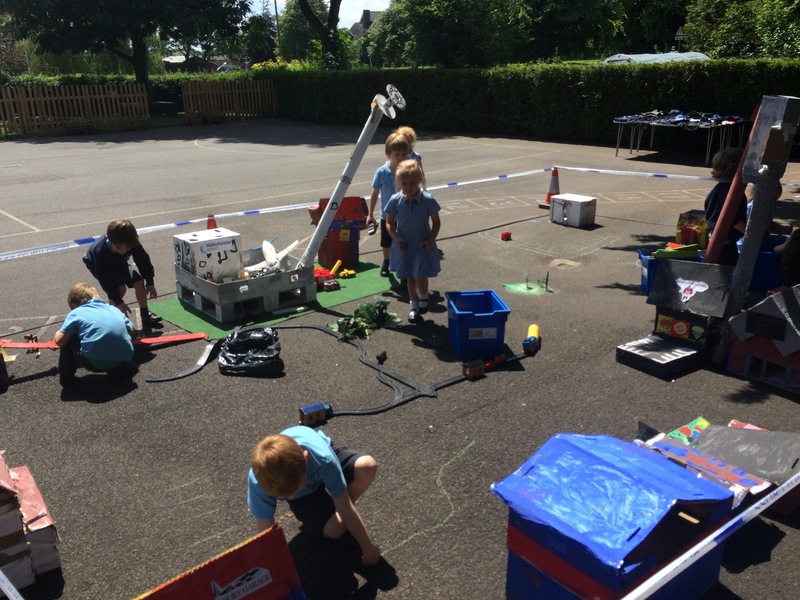 The town outlines all came together after careful planning- thinking about how we’d make roads, if we’d have trees, cars, people, traffic lights and street lights. 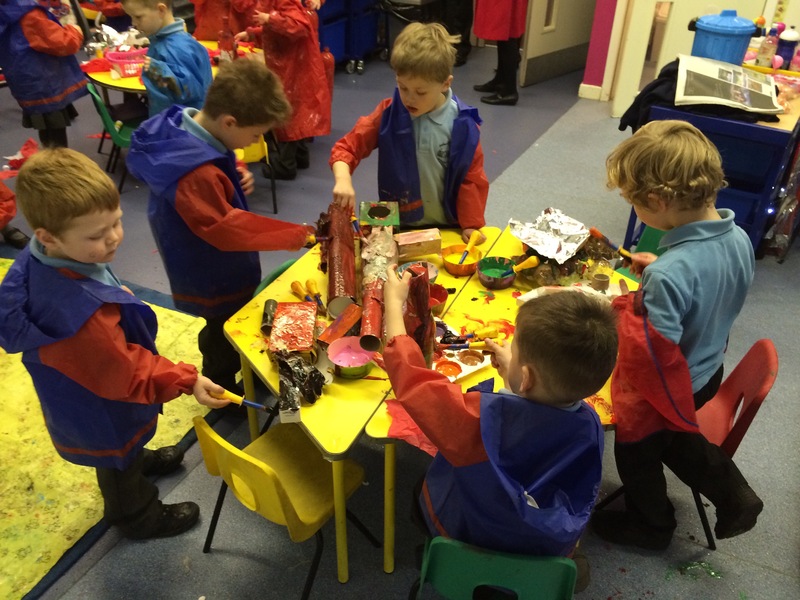 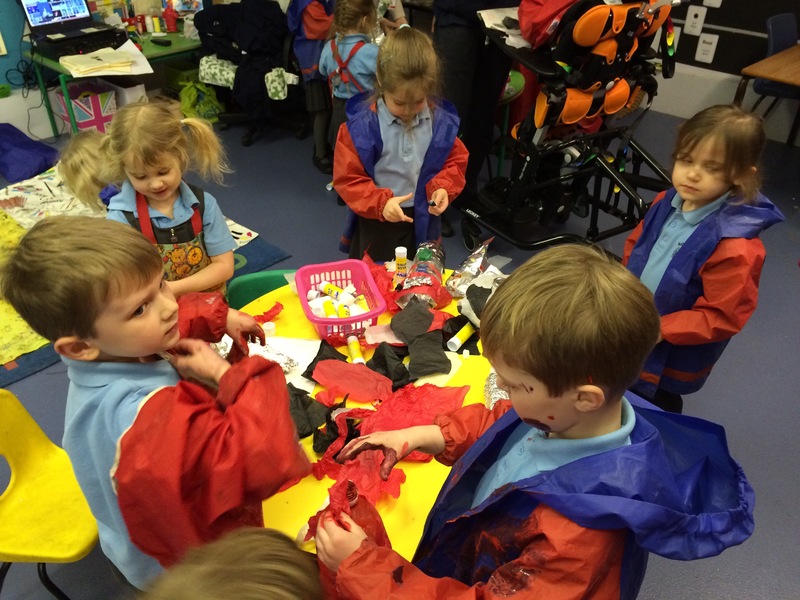 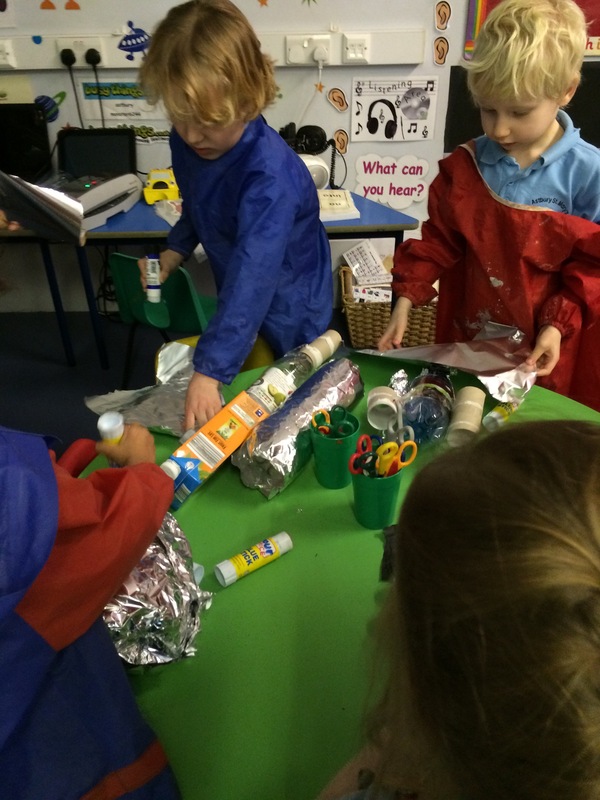 We used our resources and toys to make these things then gathered everything together. 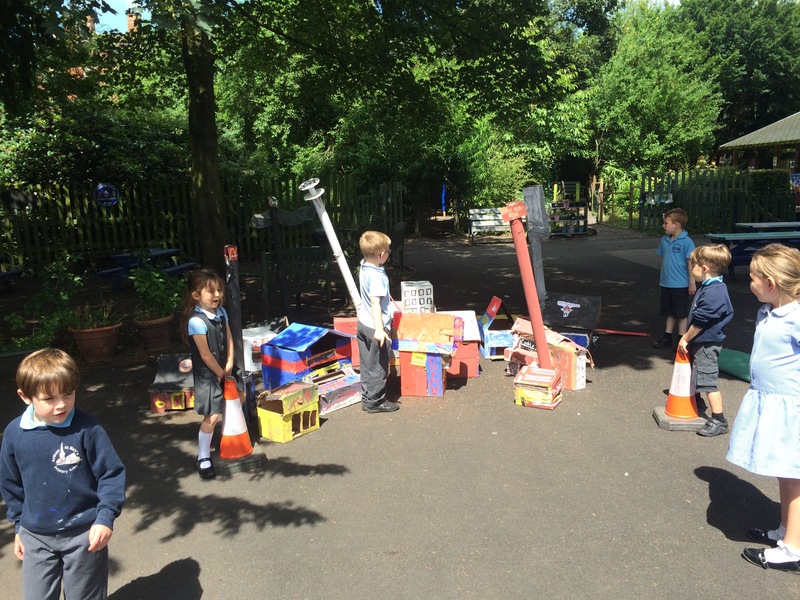 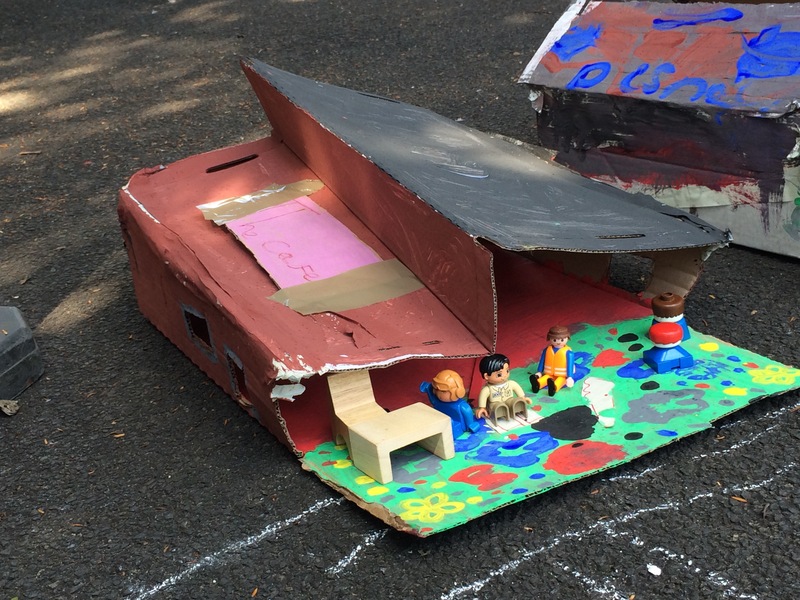 Then today when nobody was looking we built a whole town on the playground ﻿all by ourselves! 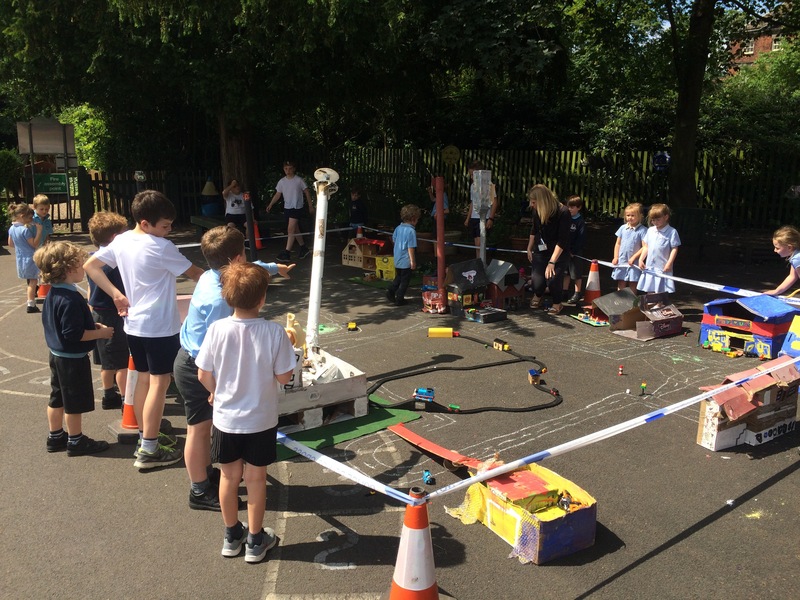 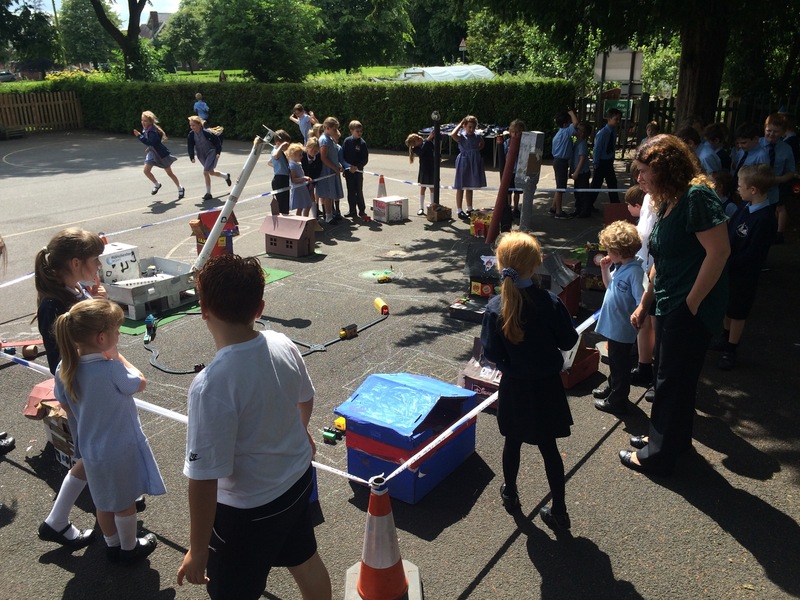 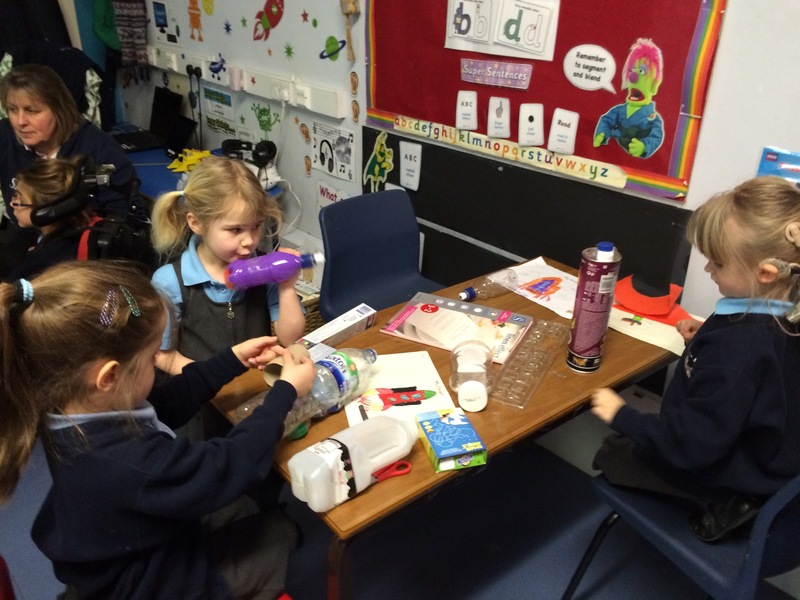 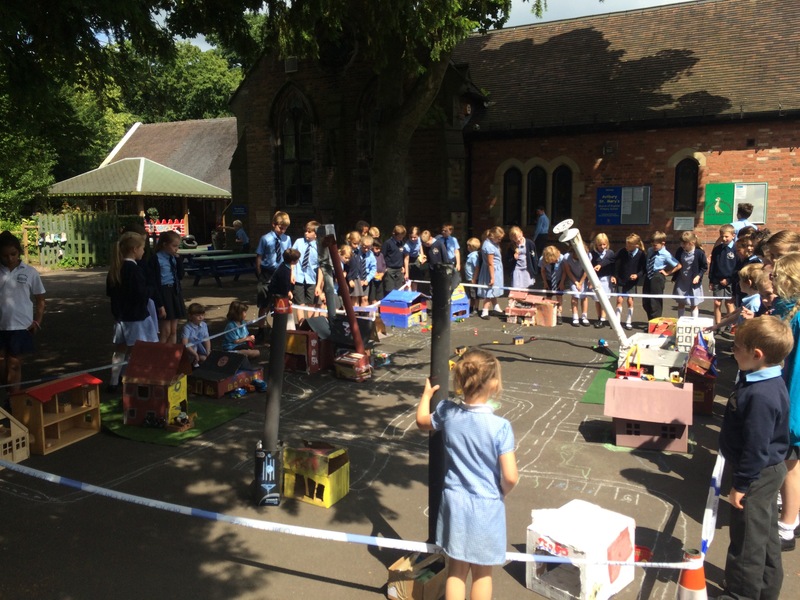 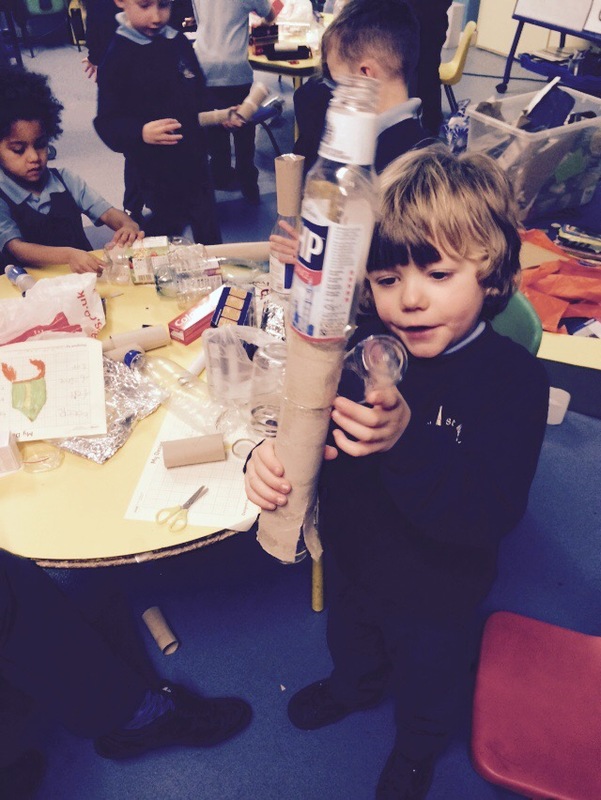 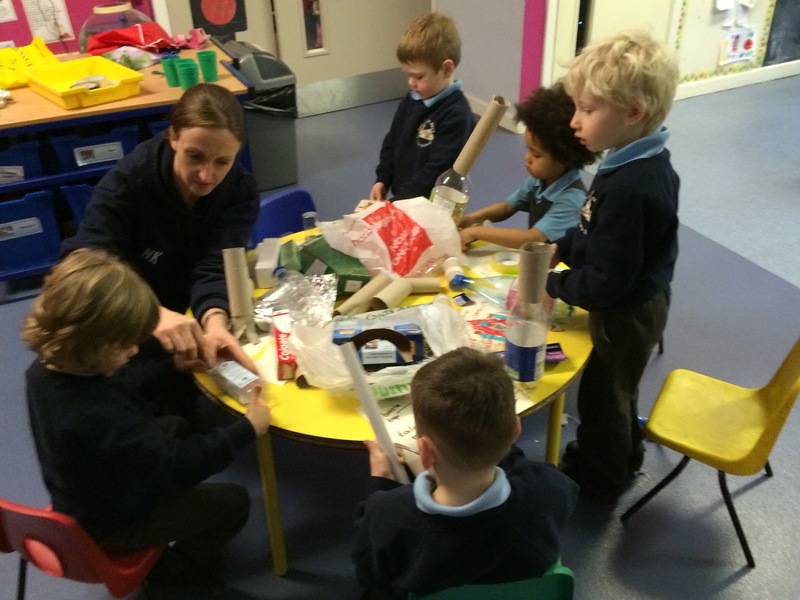 We can not explain how excited we were today about rocket making. 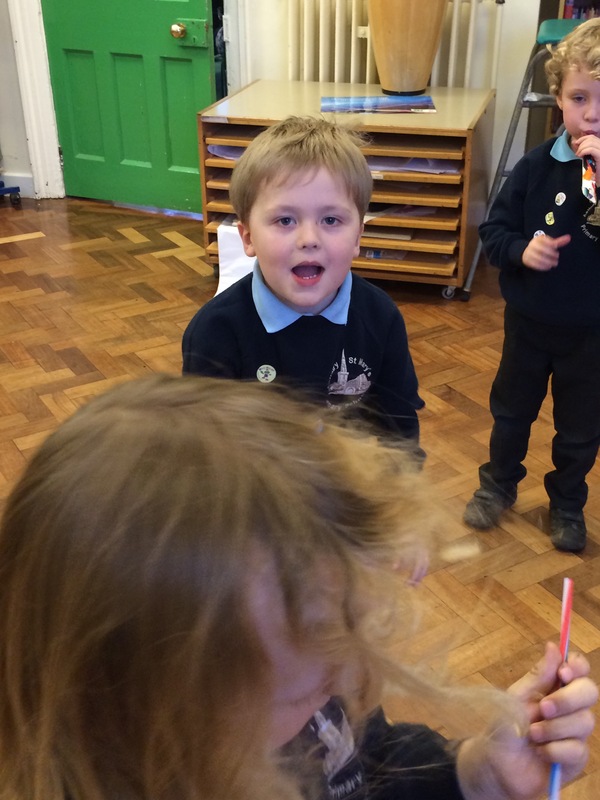 We came in super hyped up and raring to go. 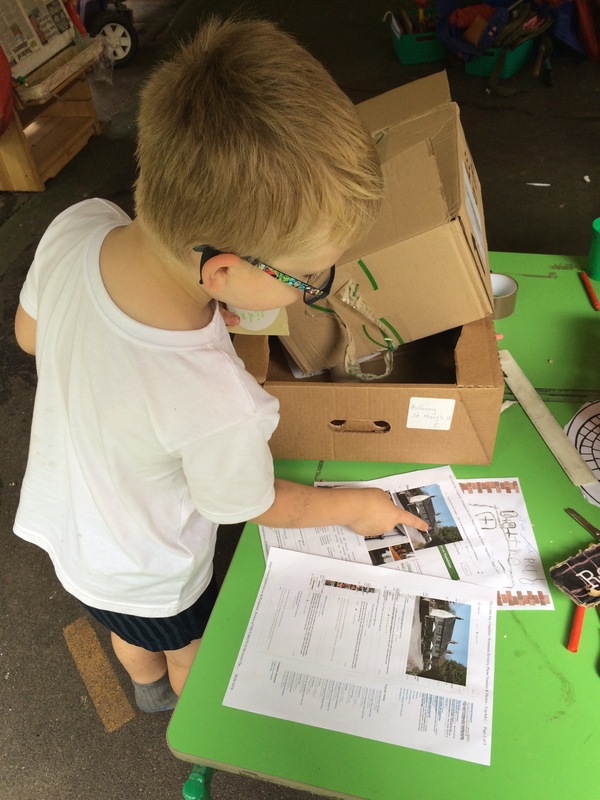 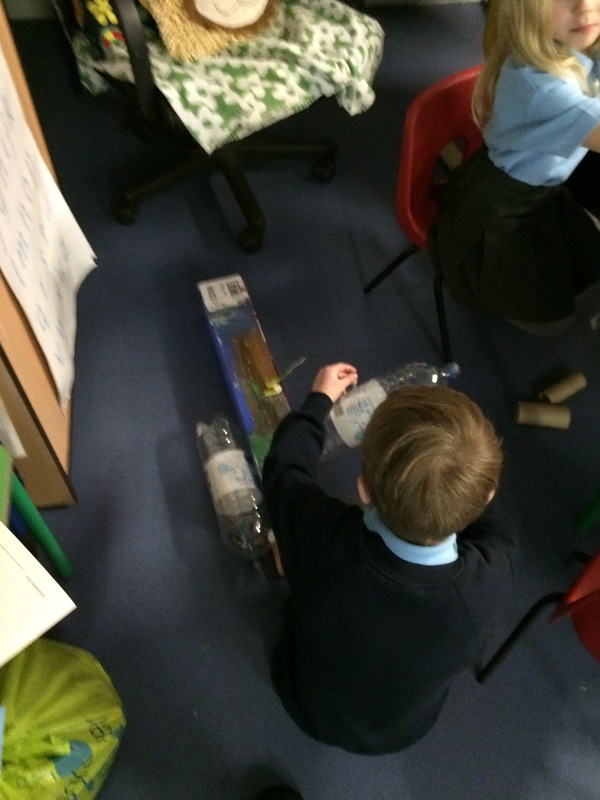 We collected our materials and set to a few hours of hard engineering. 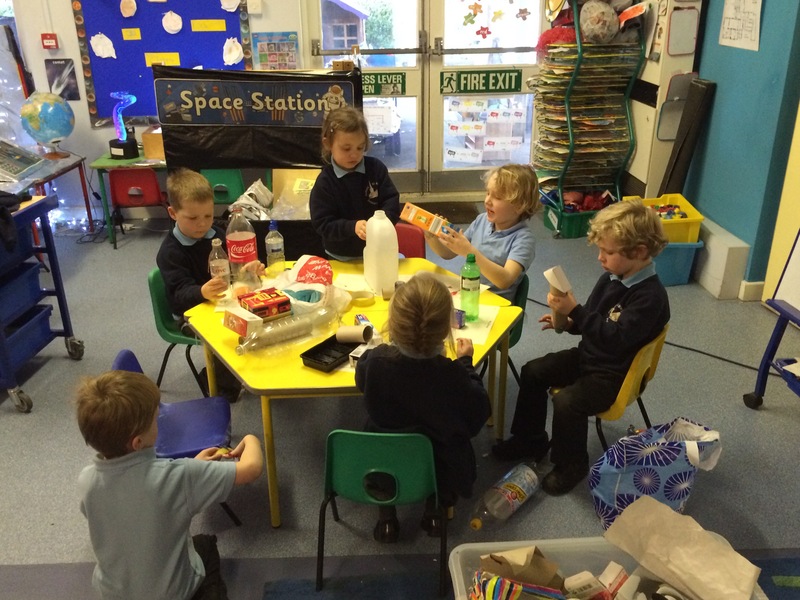 We worked so hard our rocket models were made by lunch. 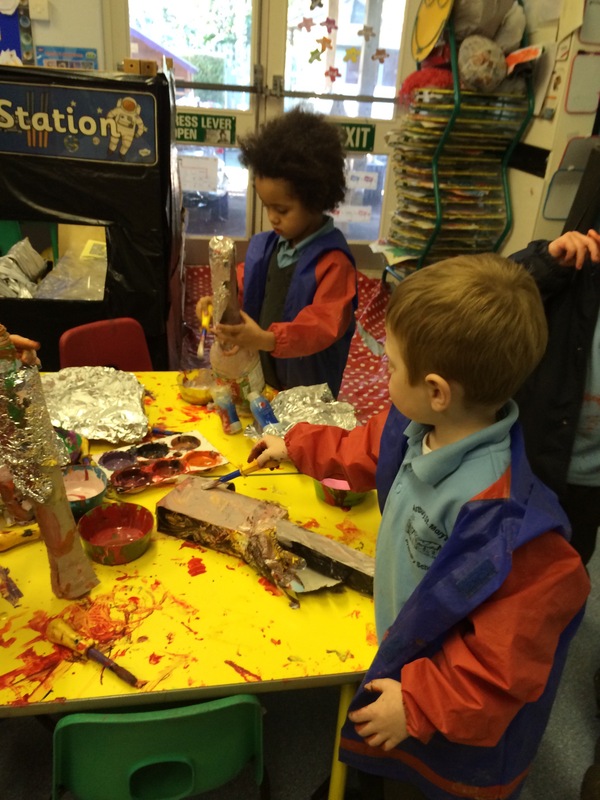 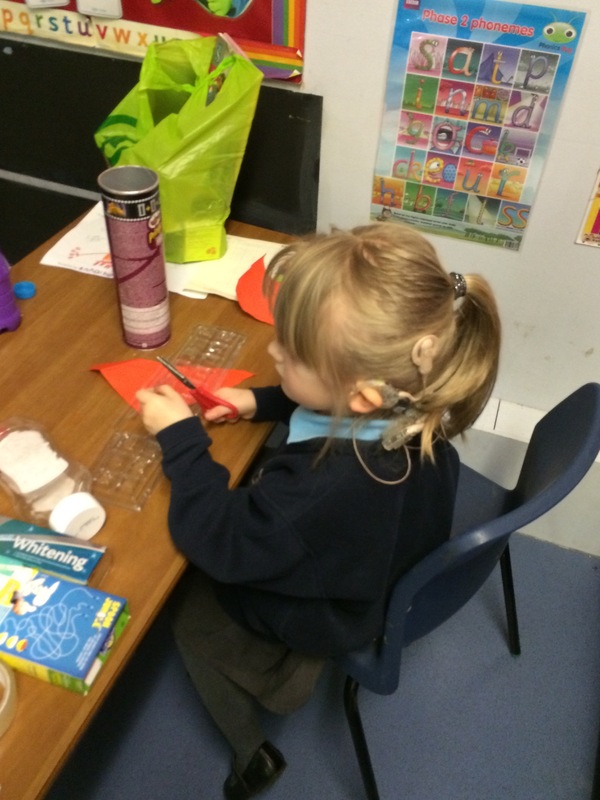 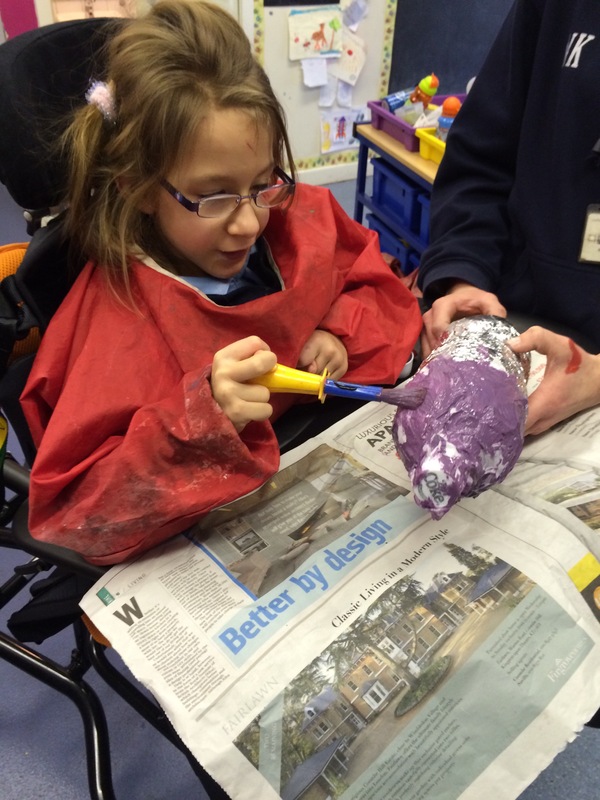 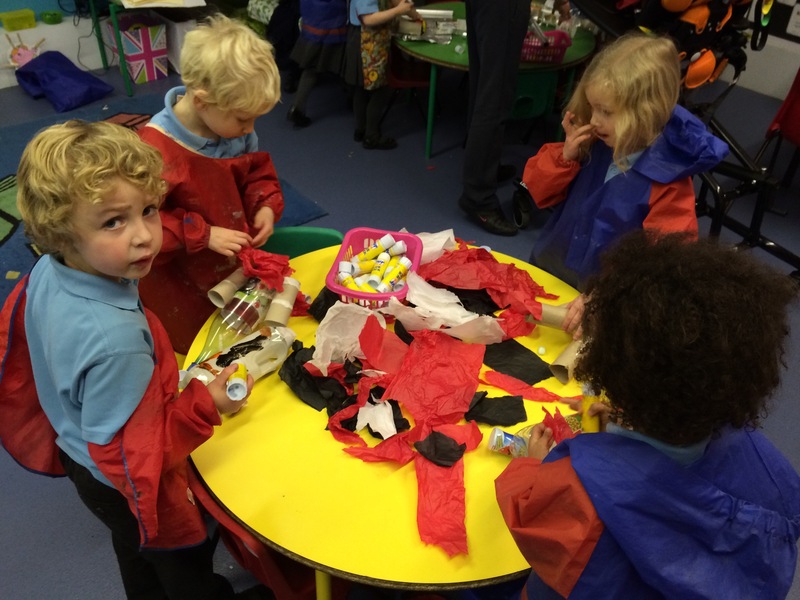 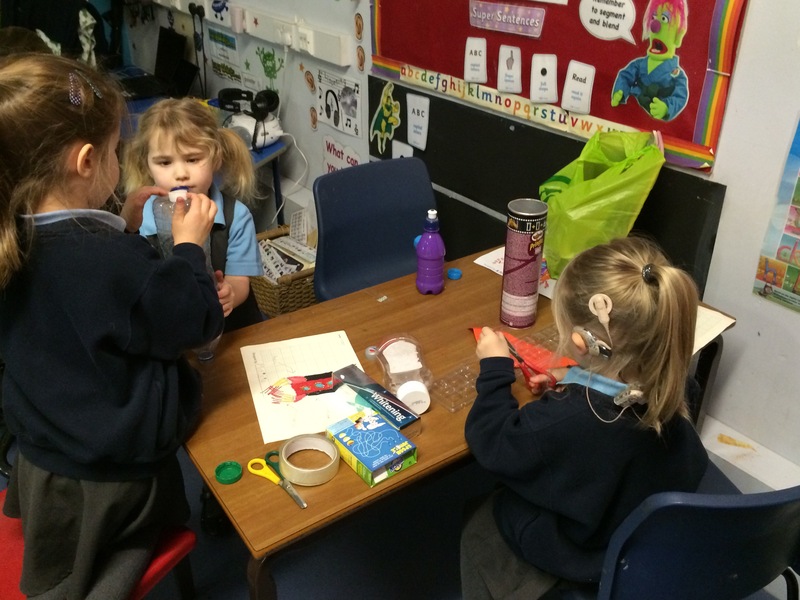 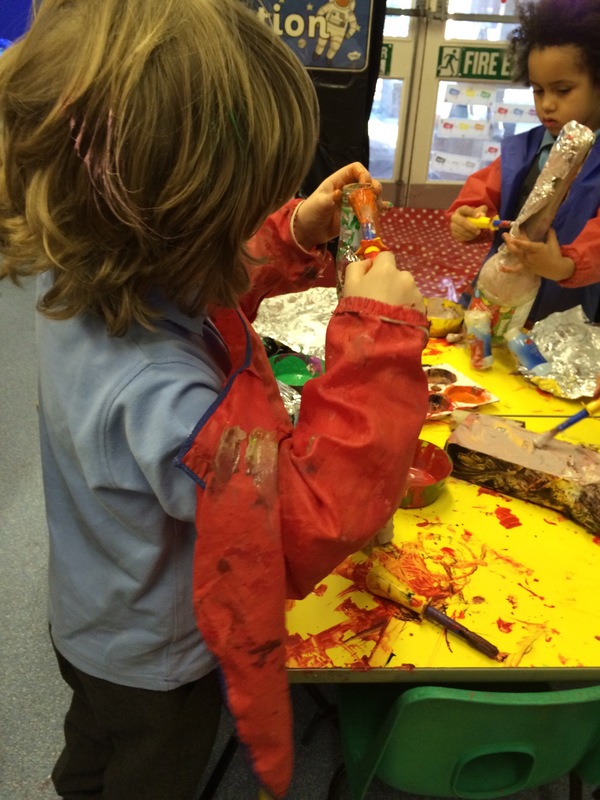 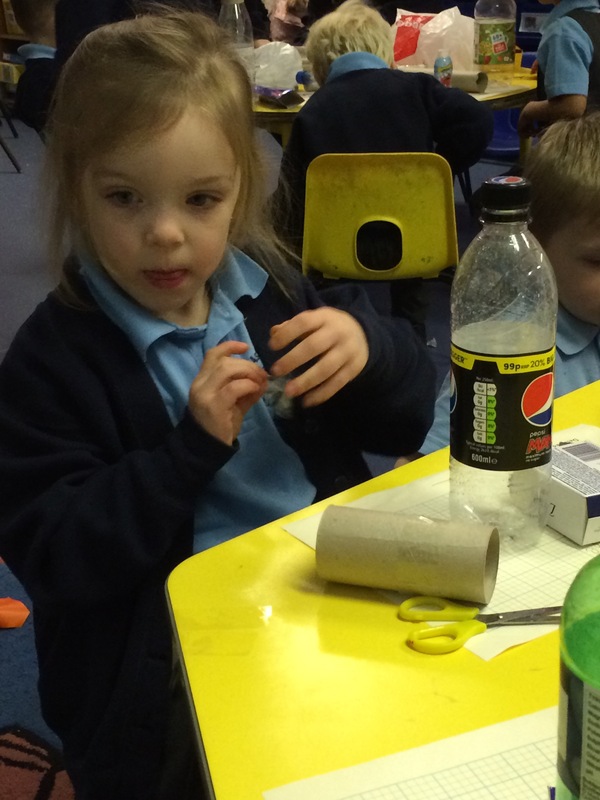 All that was left after lunch was to decorate our rockets with paint, foil, tissue paper and those extra little touches. 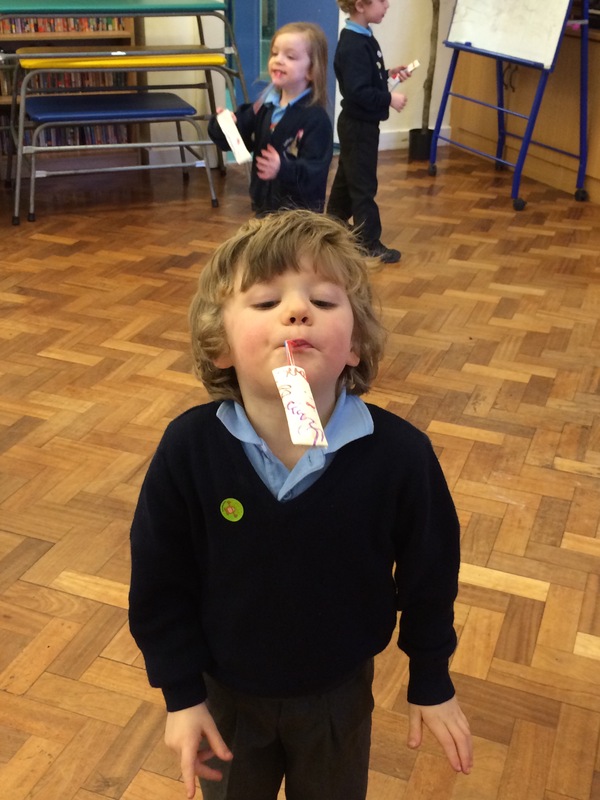 Galaxy- is not just a chocolate bar that mummies eat! 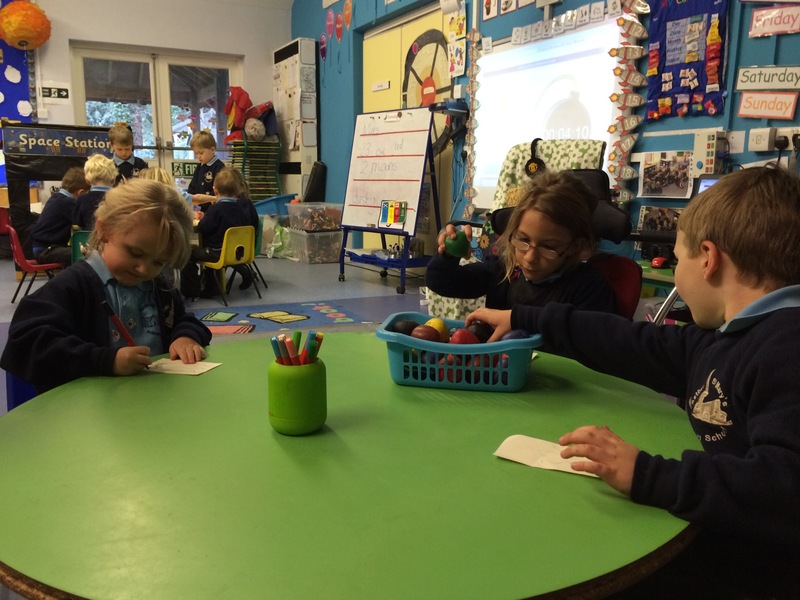 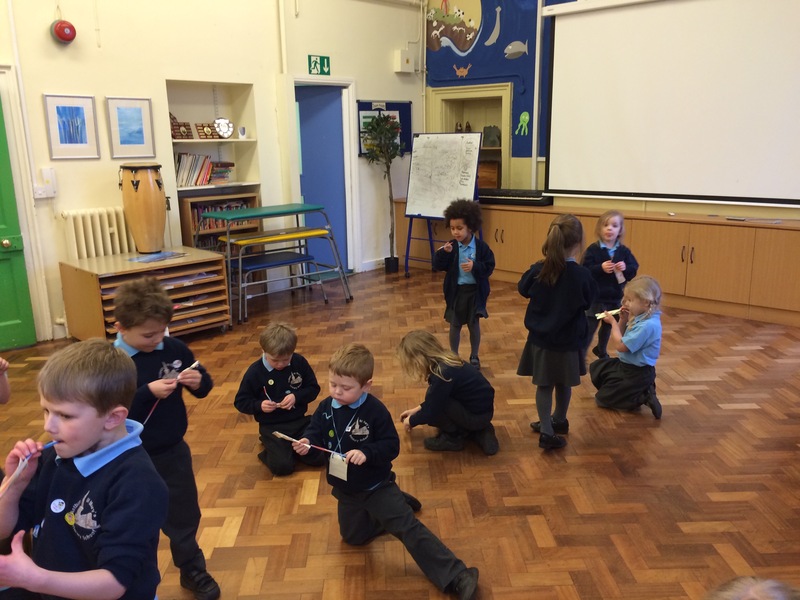 We learnt today a Galaxy is a group of stars. 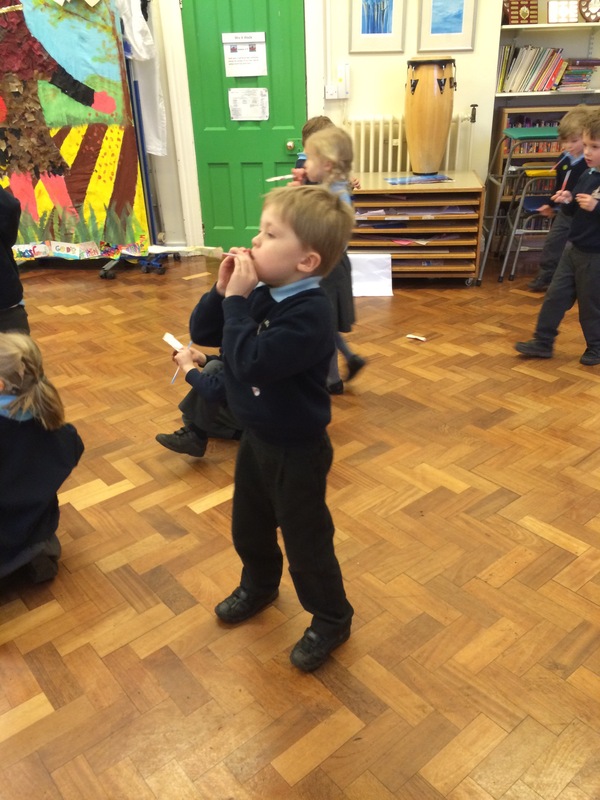 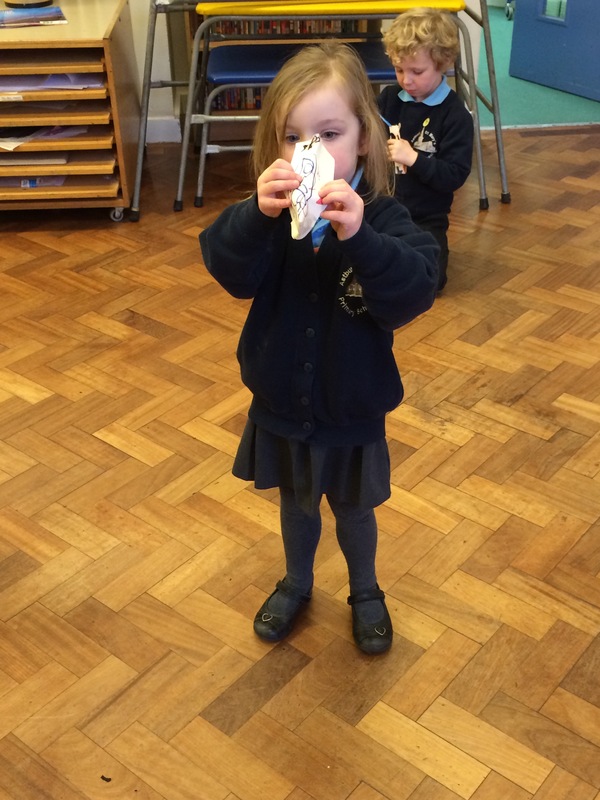 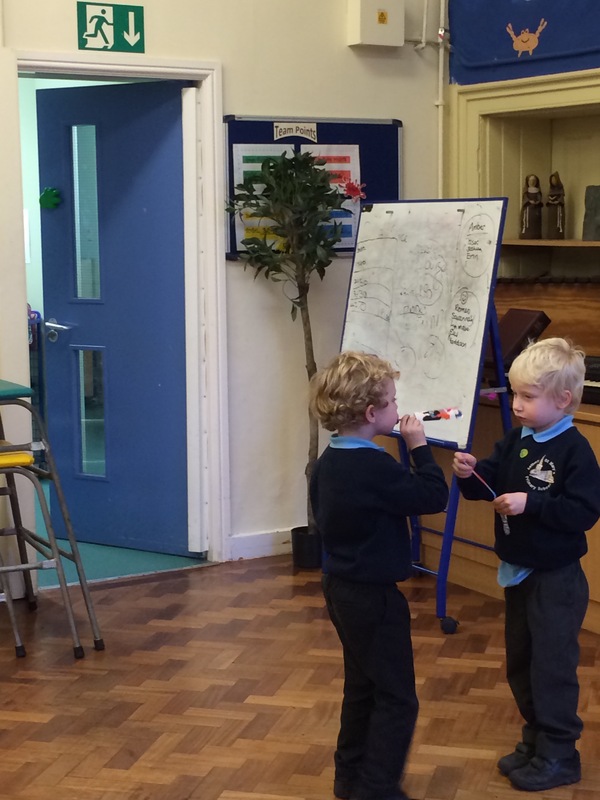 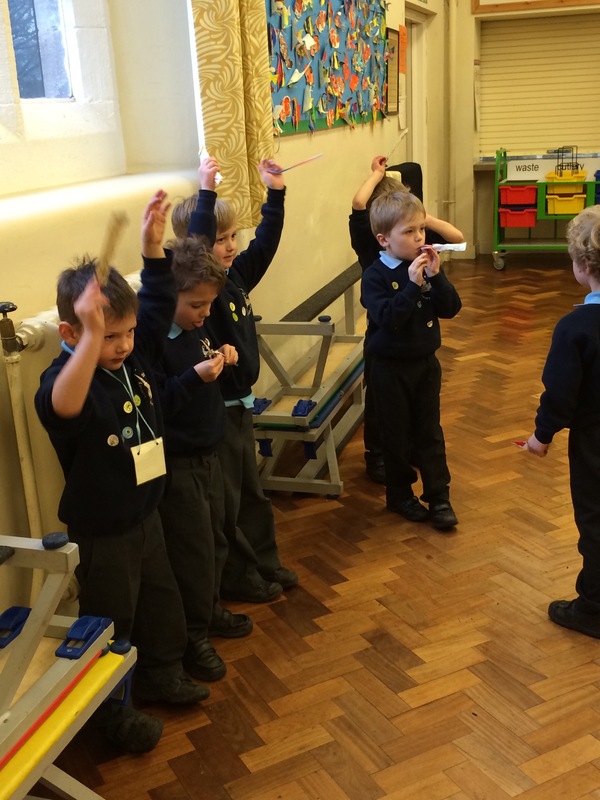 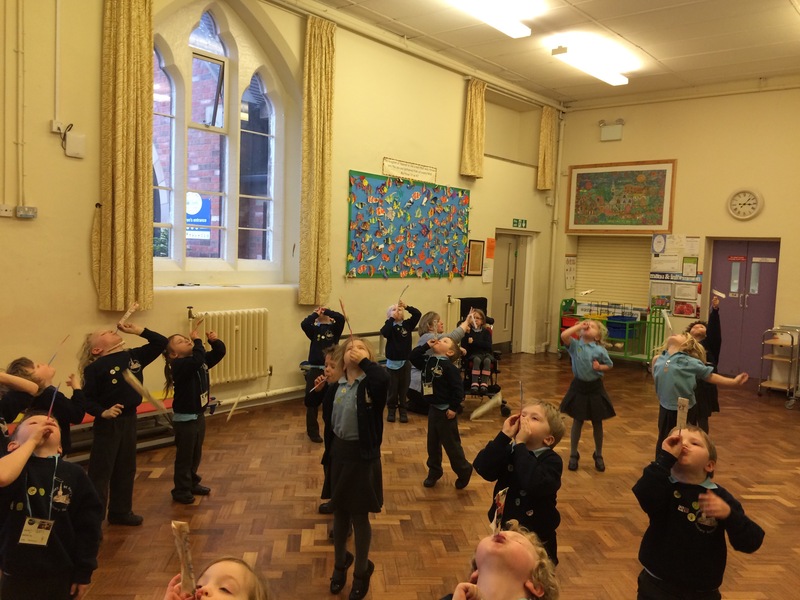 We learnt about our Galaxy the Milky Way (also not just a chocolate bar). 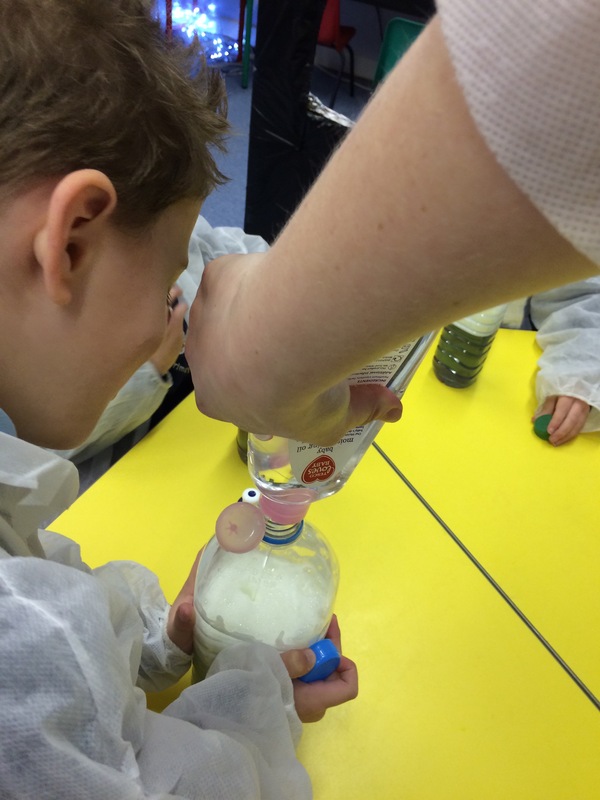 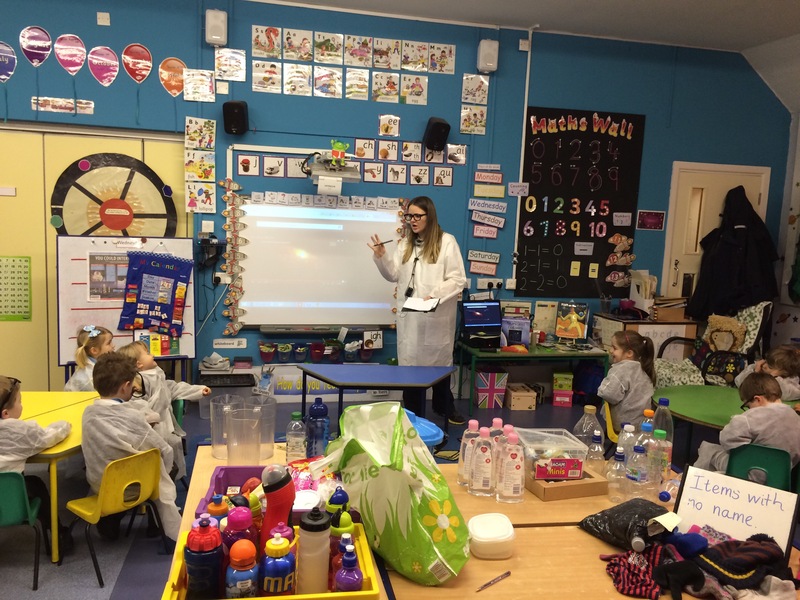 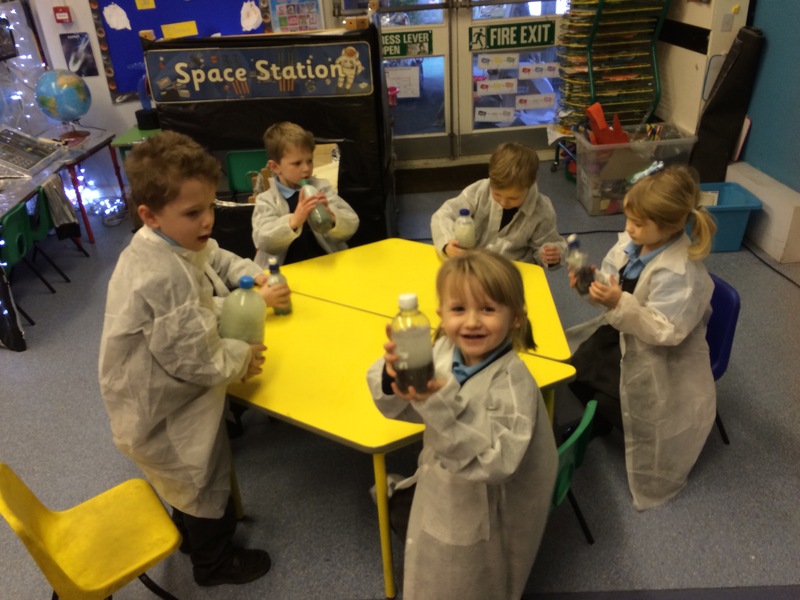 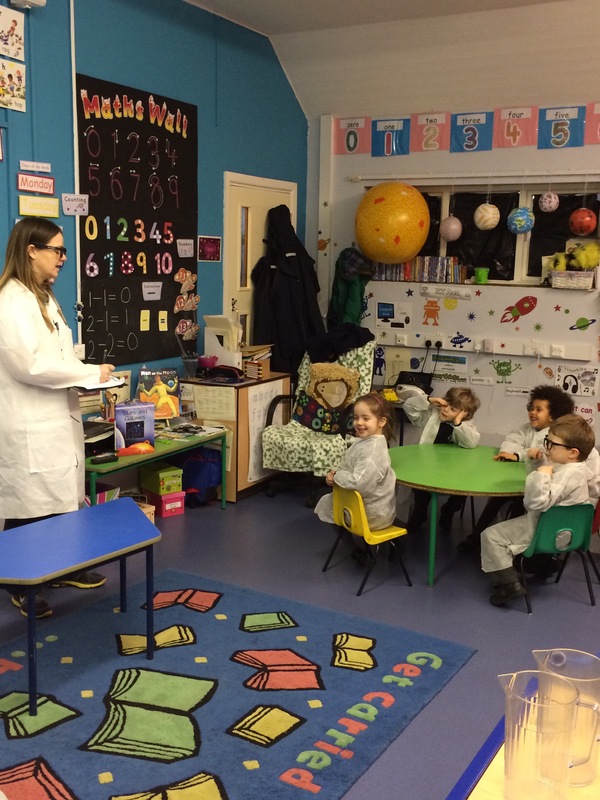 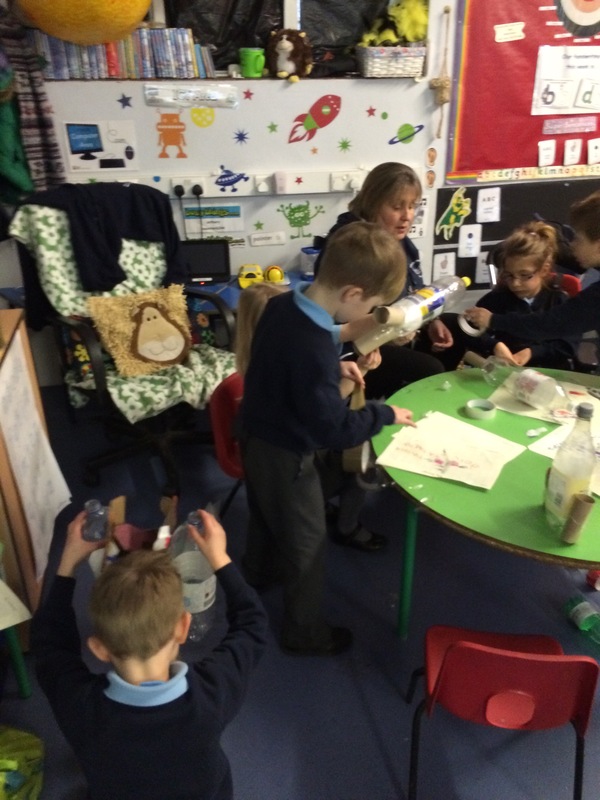 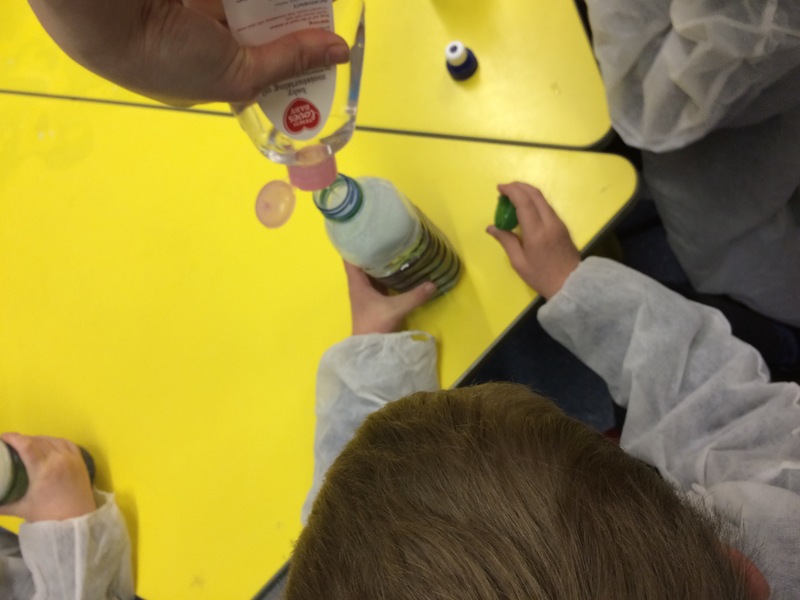 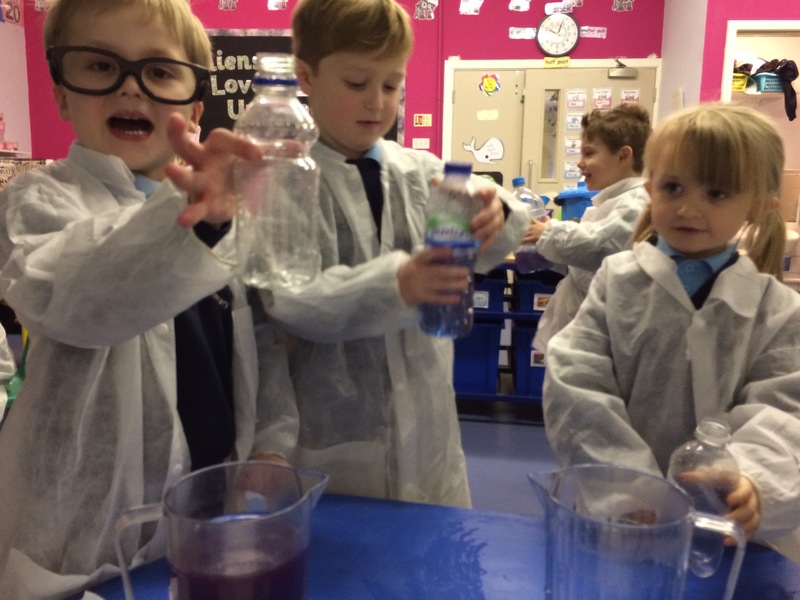 We turned into professors and doctors of science for our Galaxy making lesson. 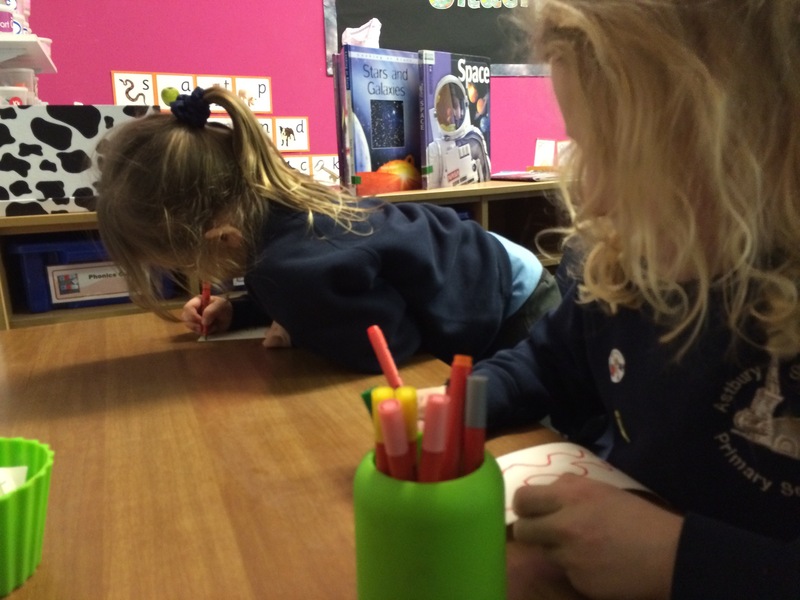 We determined what colour our galaxies should be through very scientific discussion. 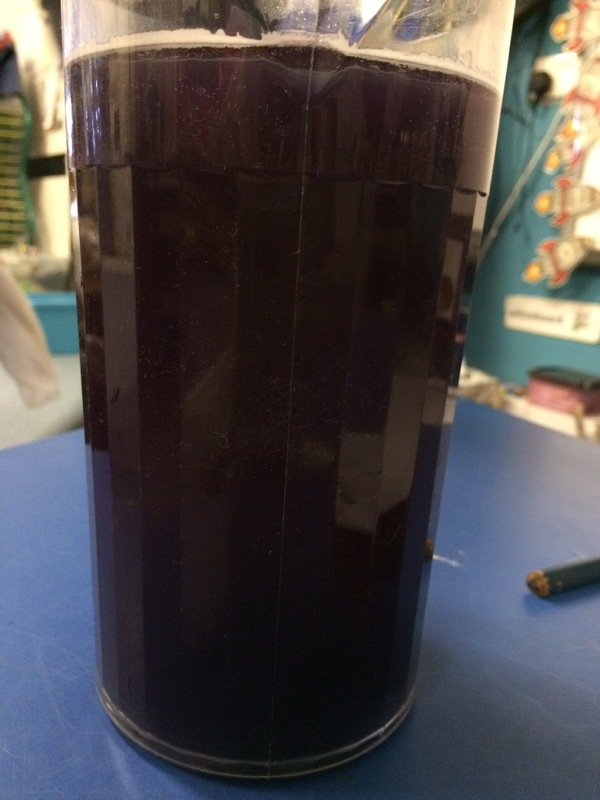 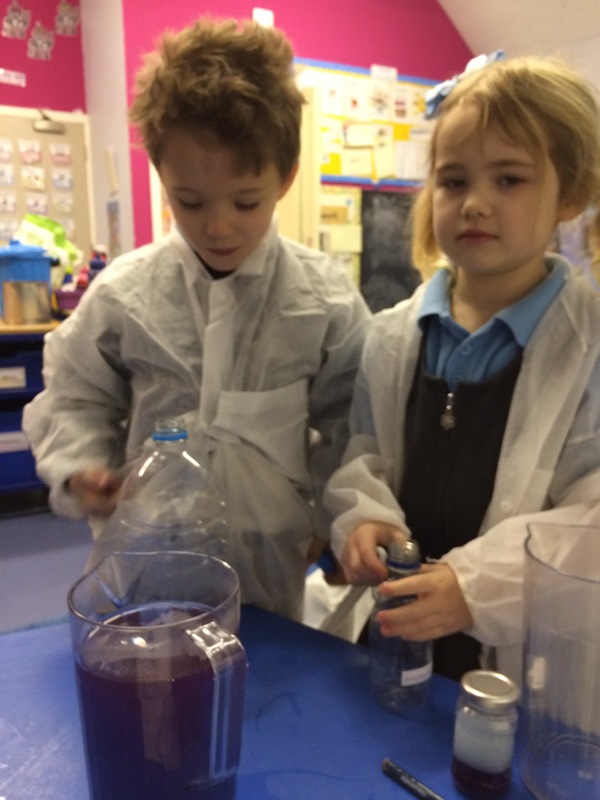 Then we discussed how to make the colour purple. 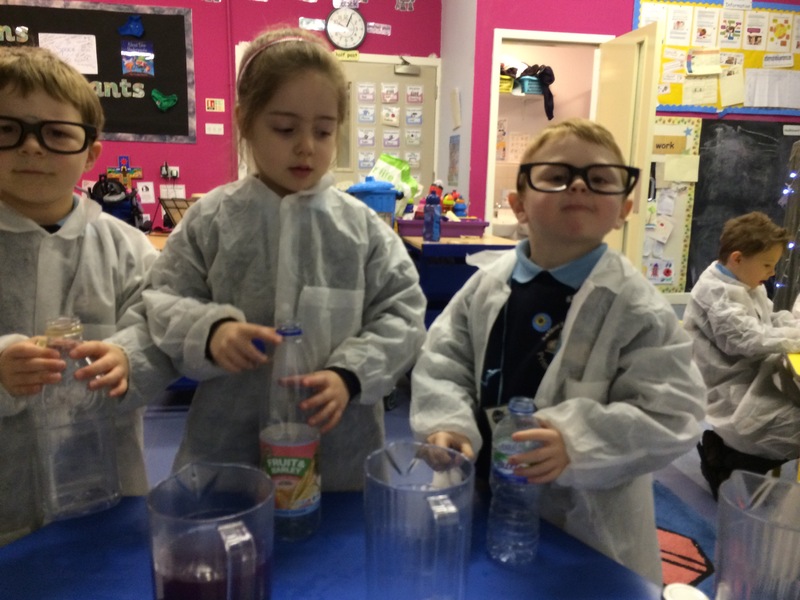 Then we mixed our ingredients. 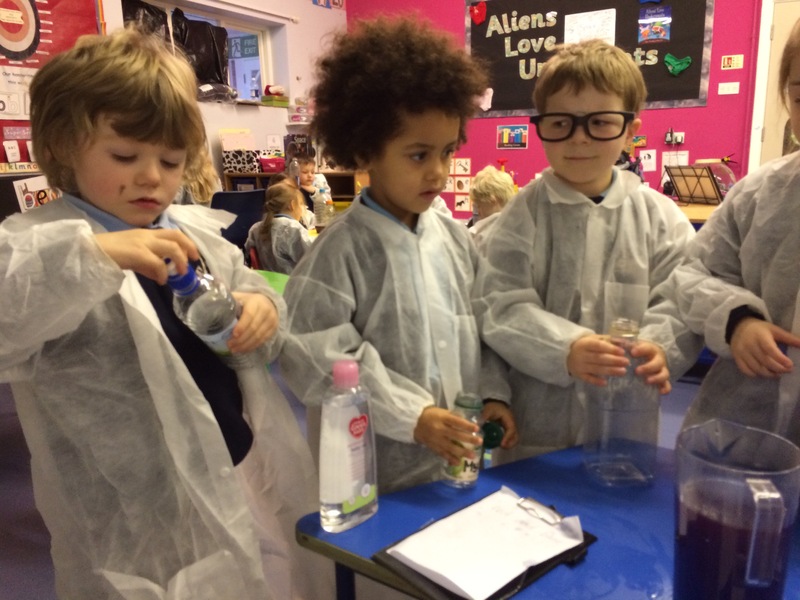 Then all that was left was too mix up the water and oil to create our Galaxies. 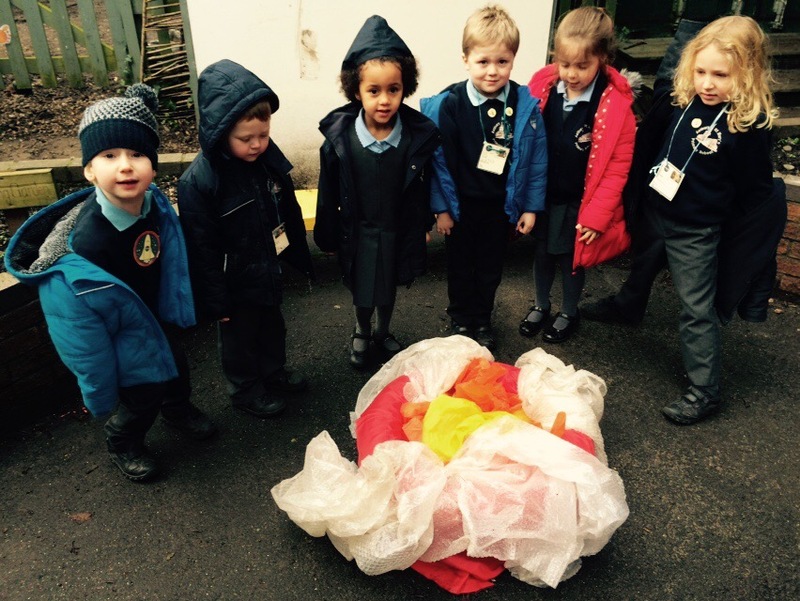 We have brought them home tonight fir you to see. 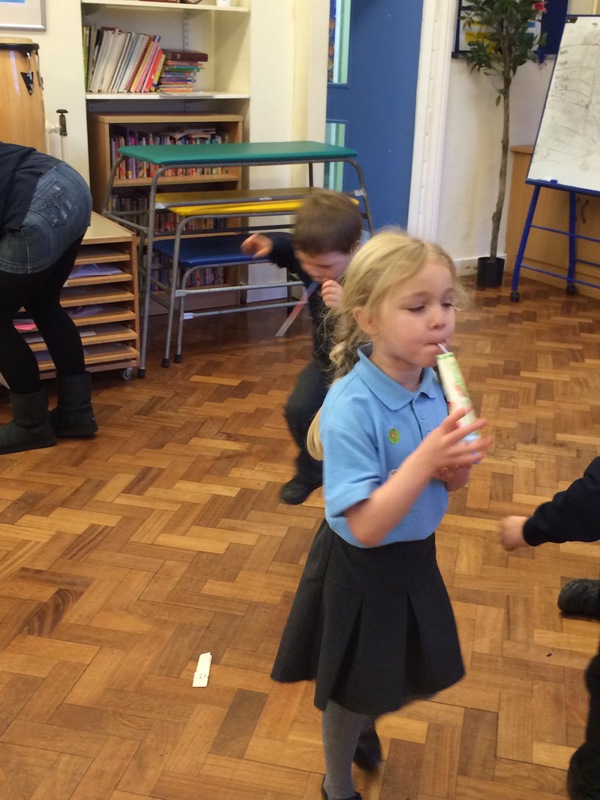 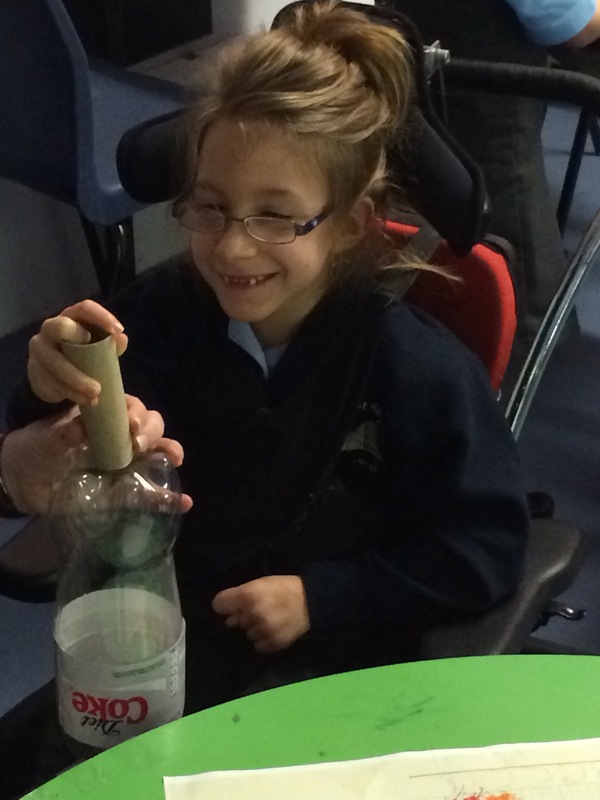 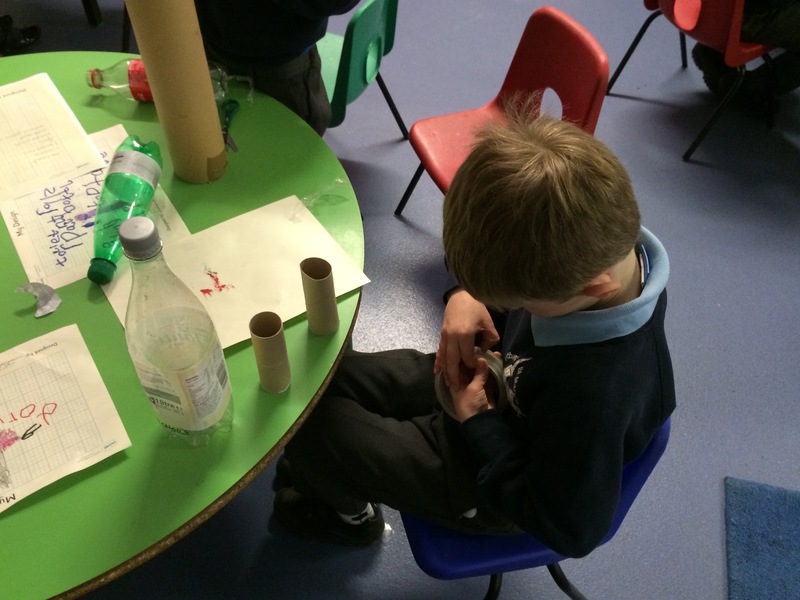 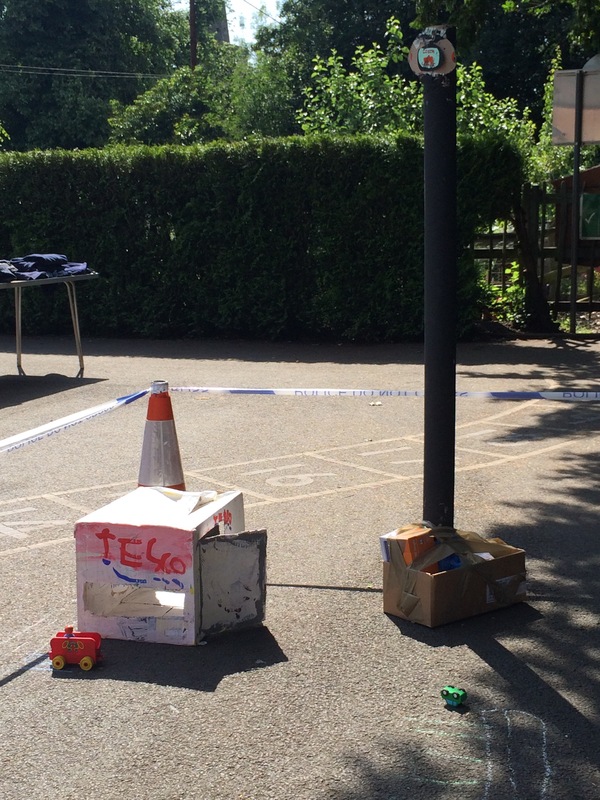 This afternoon we made very simple rockets. 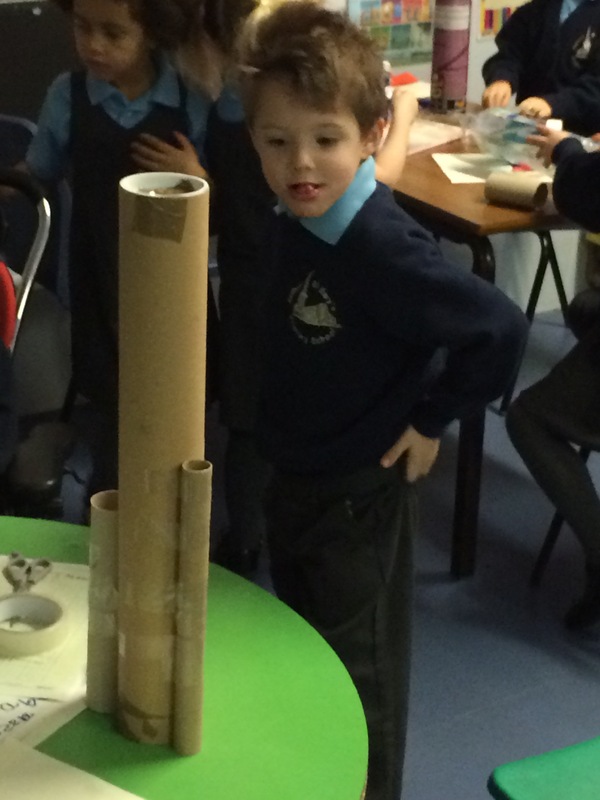 We first designed our rocket. 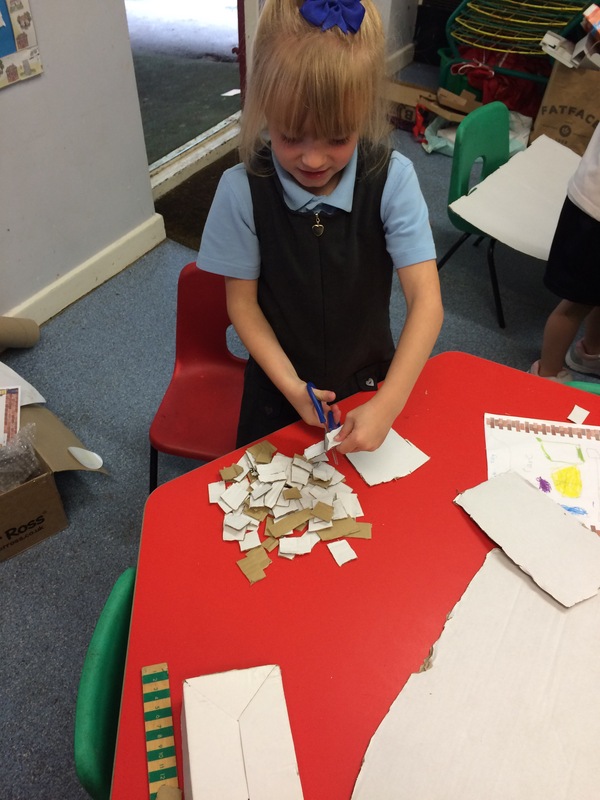 After we folded them and stick them down. 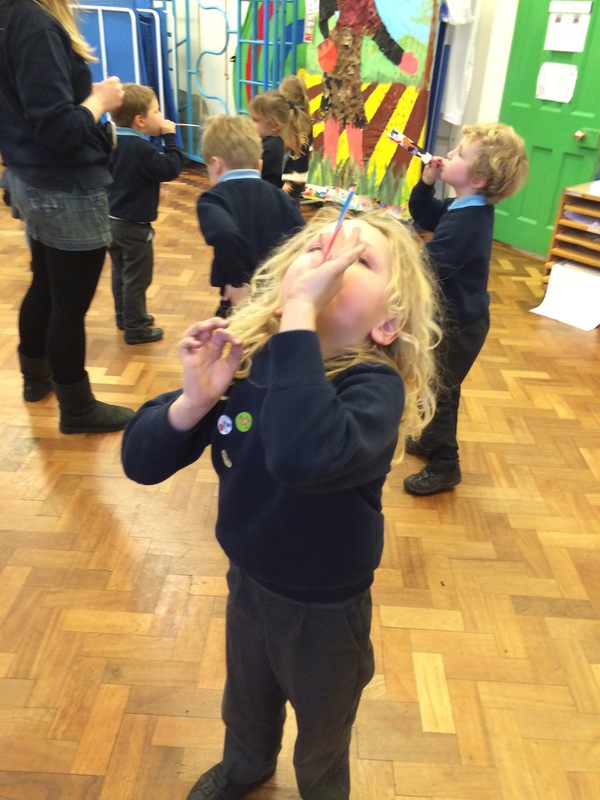 We took them to the hall to try out our rocket blowing skills. 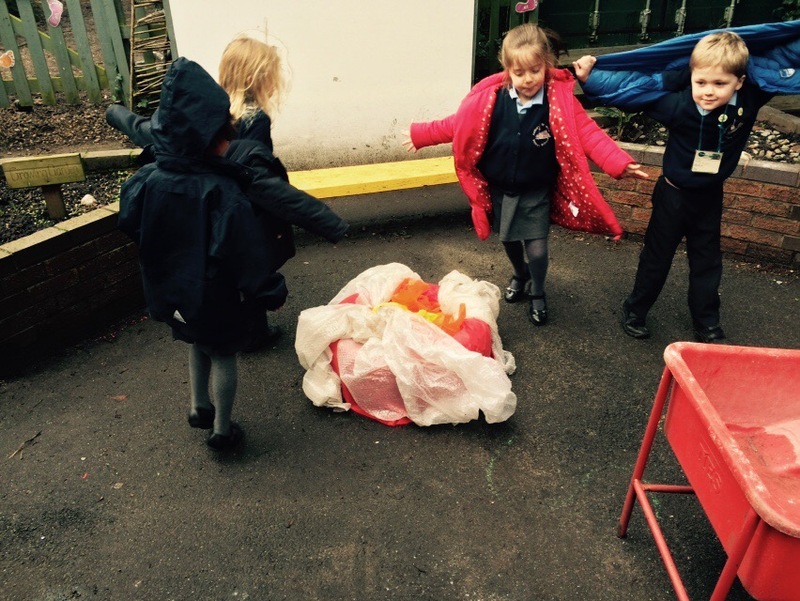 We have put them in our bags to show you at home. 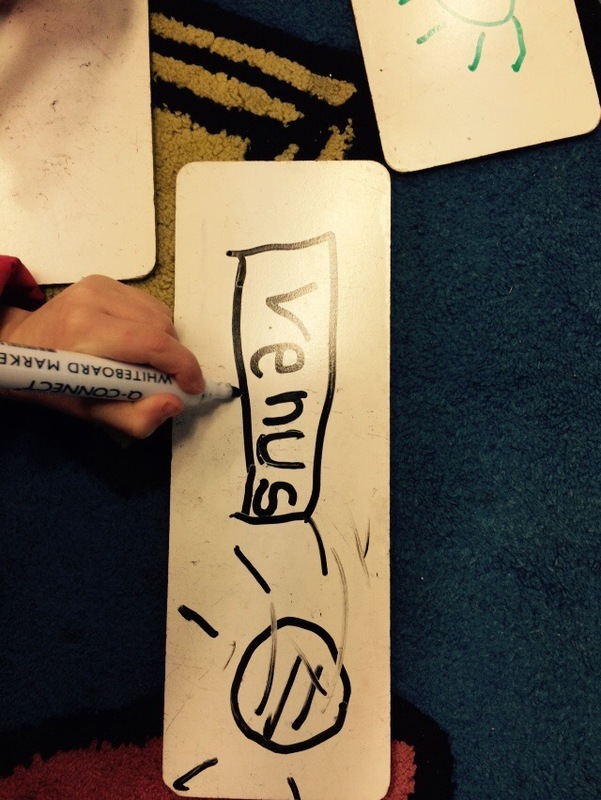 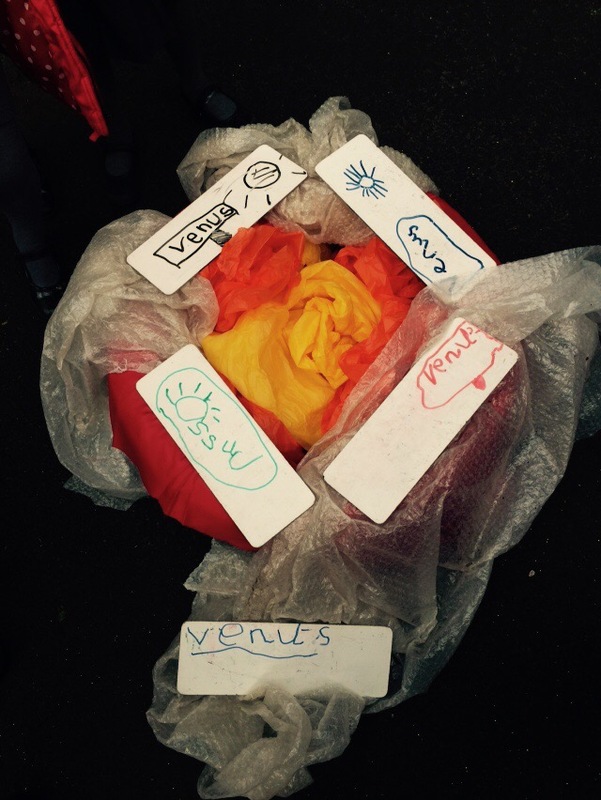 We have been learning about the different planets in our Solar System. 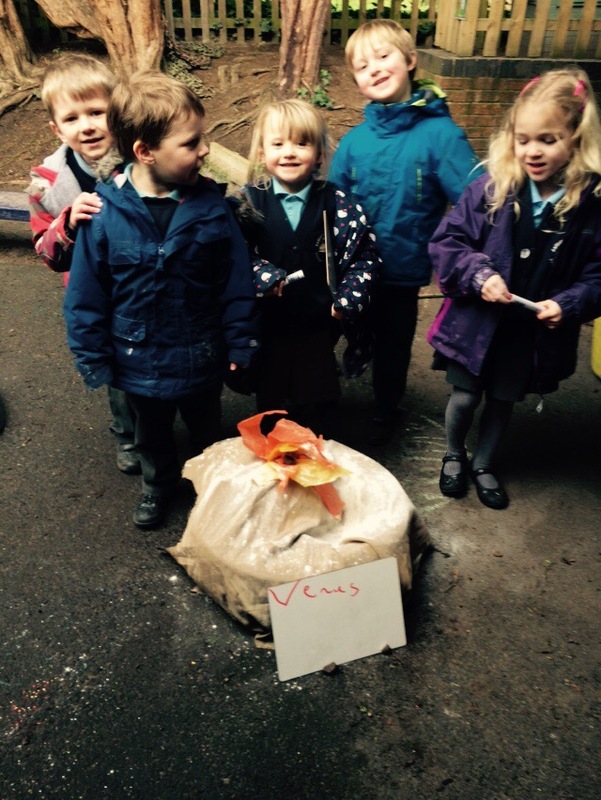 We have learnt facts about Mercury, Venus, our planet Earth and Mars. 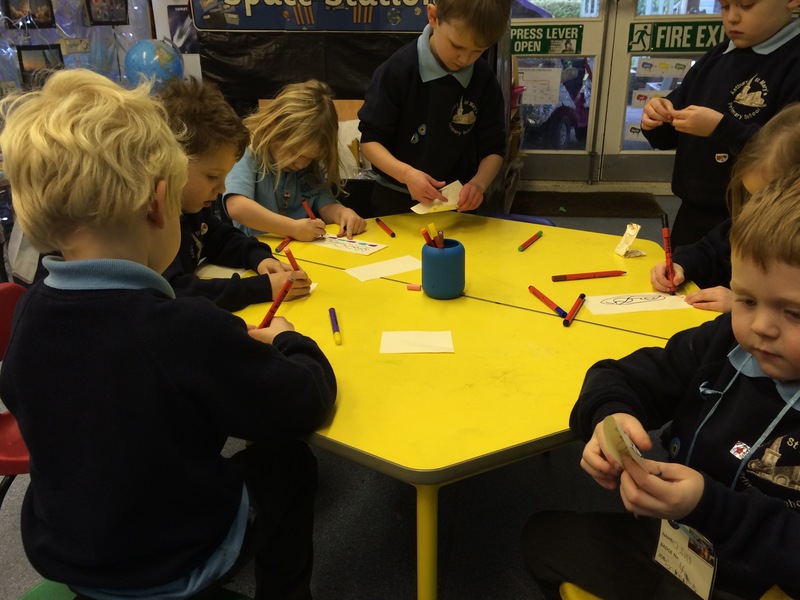 As well as writing about them this week we have also made them. 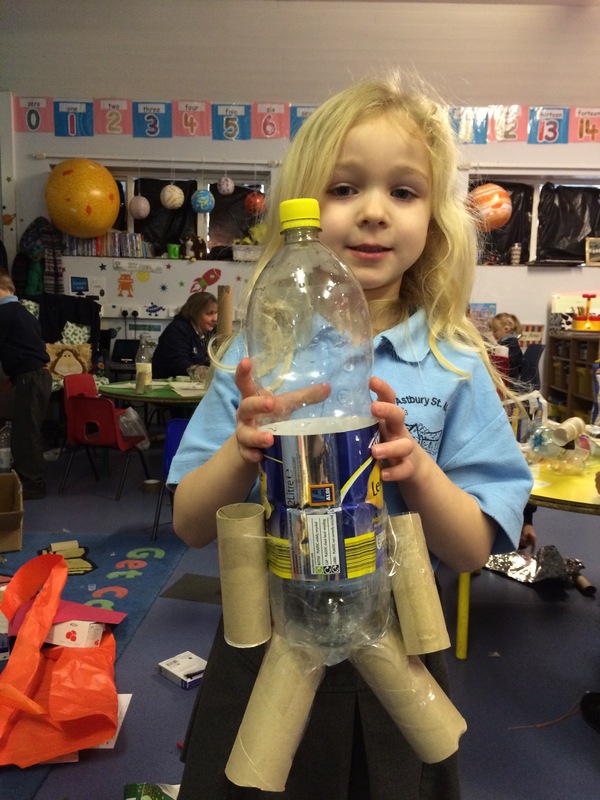 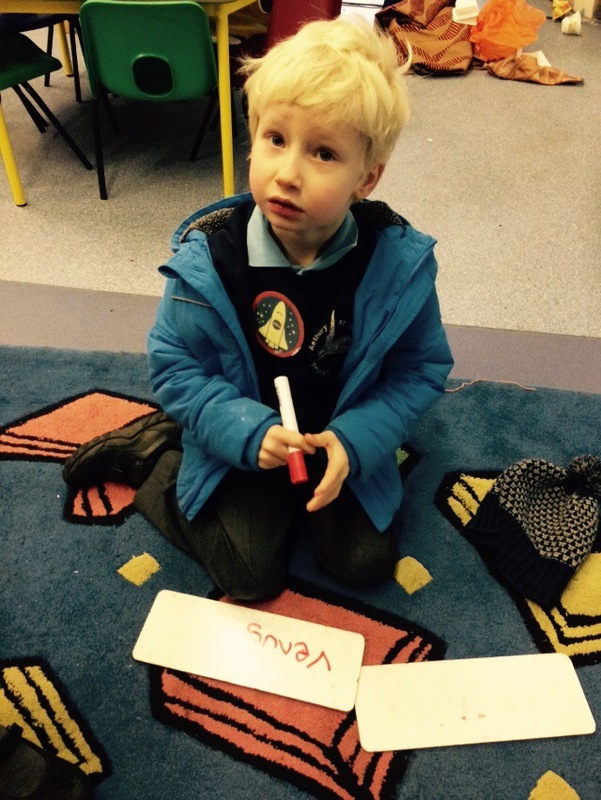 Next week we will be learning more planets and learning about Rockets. 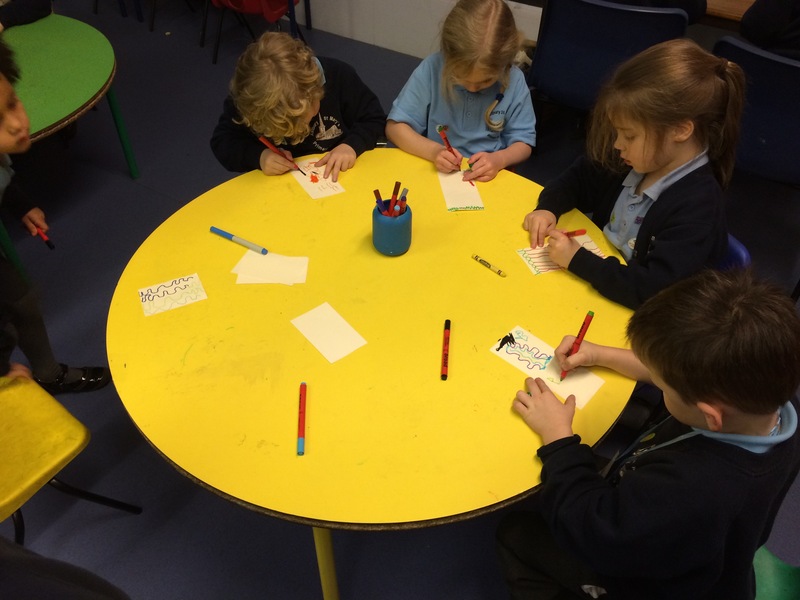 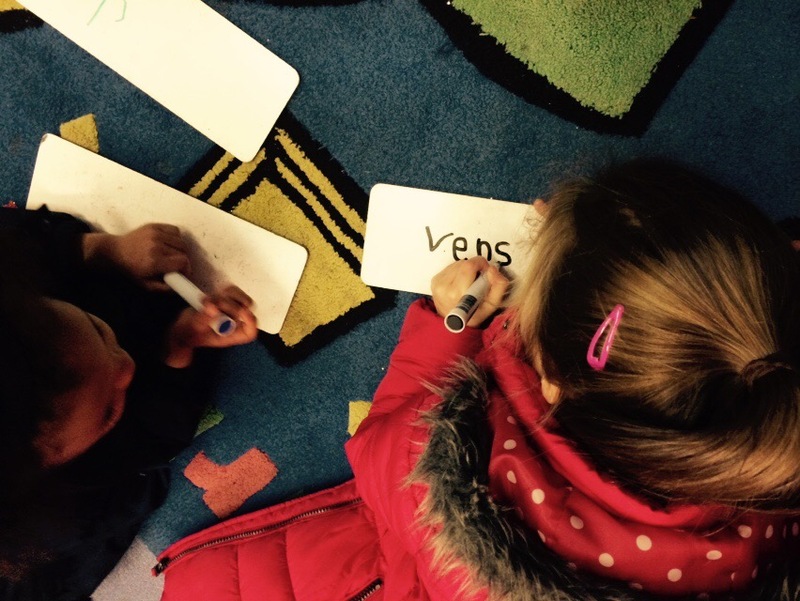 We will also be continuing with our take aways and super sentence writing. 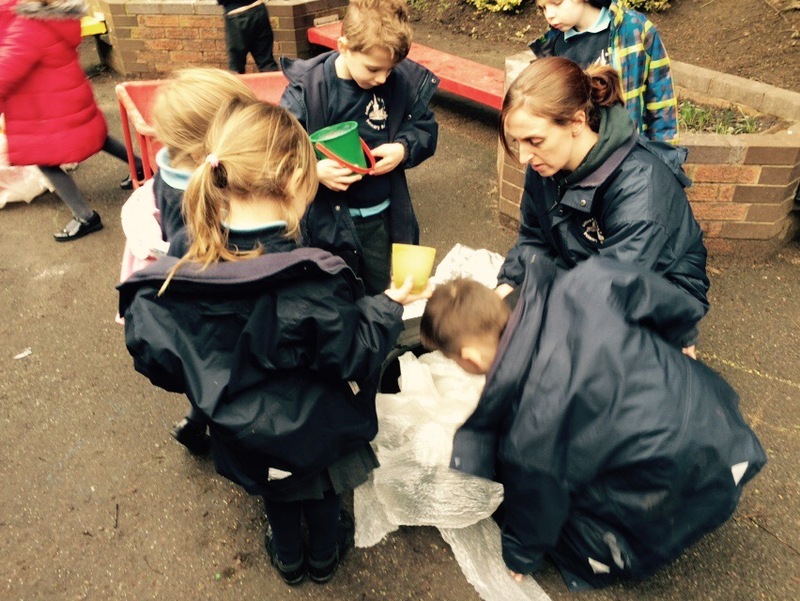 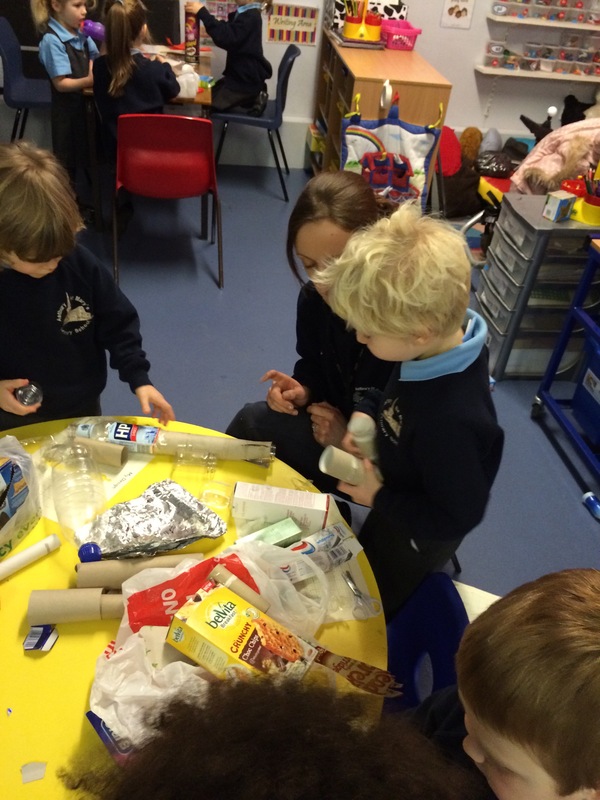 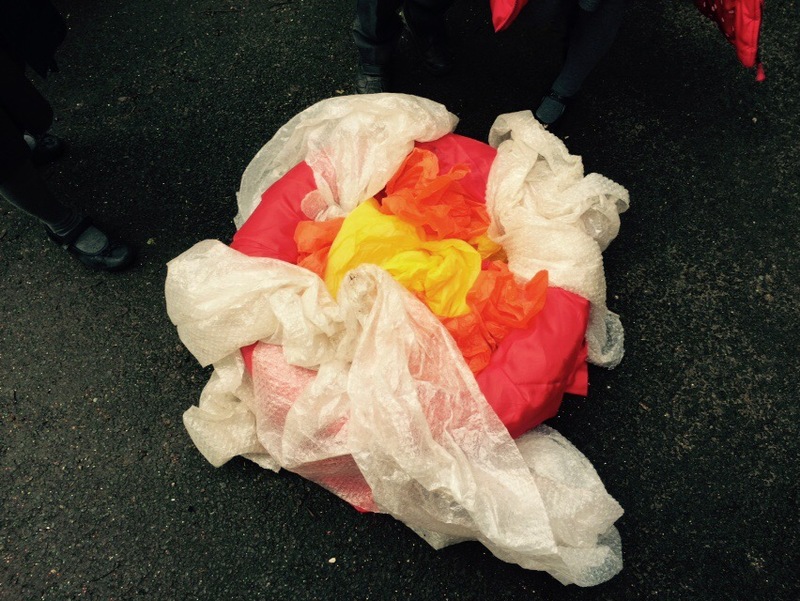 For making our Rockets next week we need to save some materials to build them. 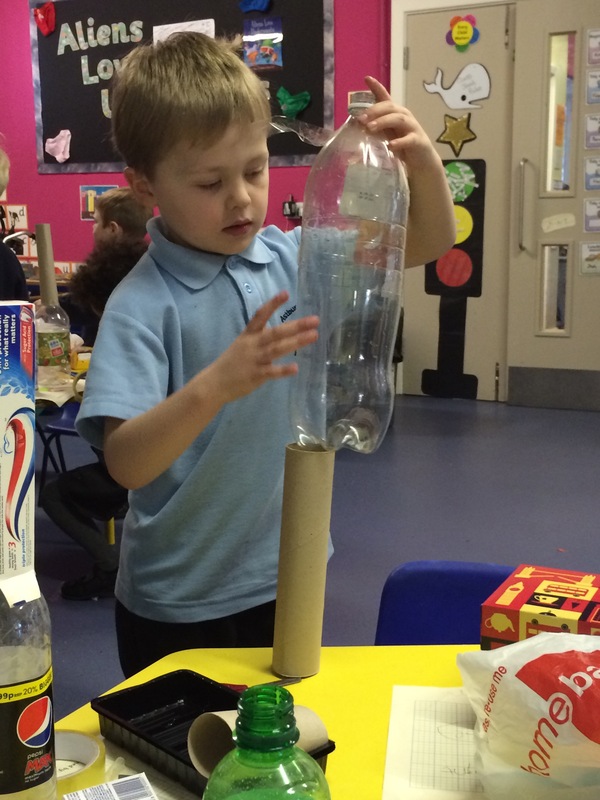 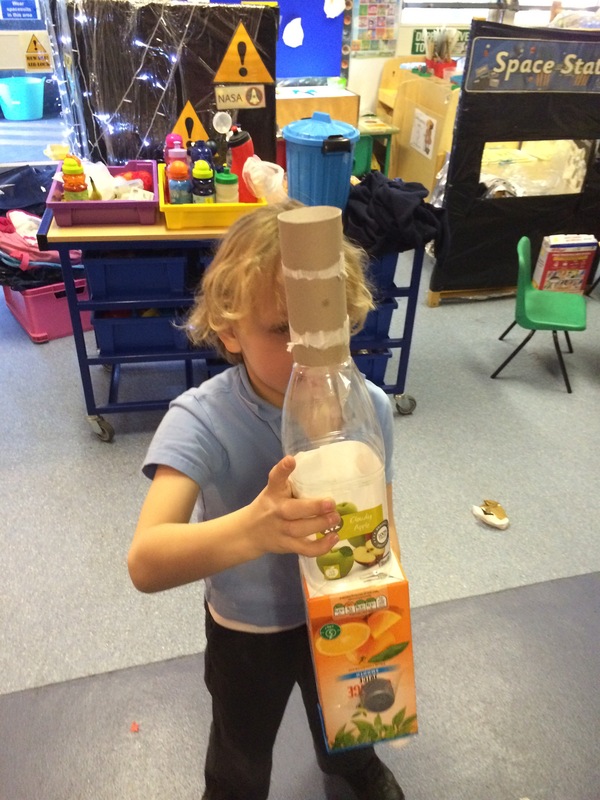 By the end of this week we will have learnt a lot about rockets and what they look like. 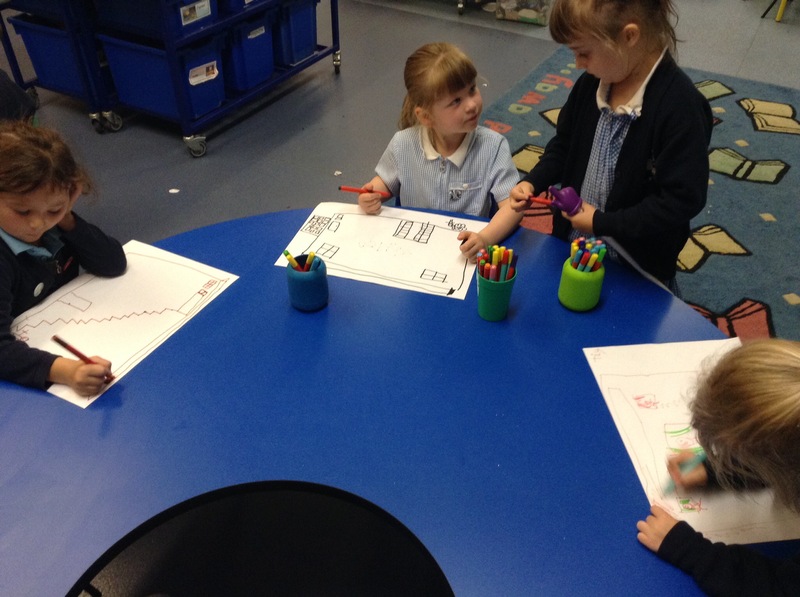 We will have made our design by Friday and will bring a copy home for you to see. 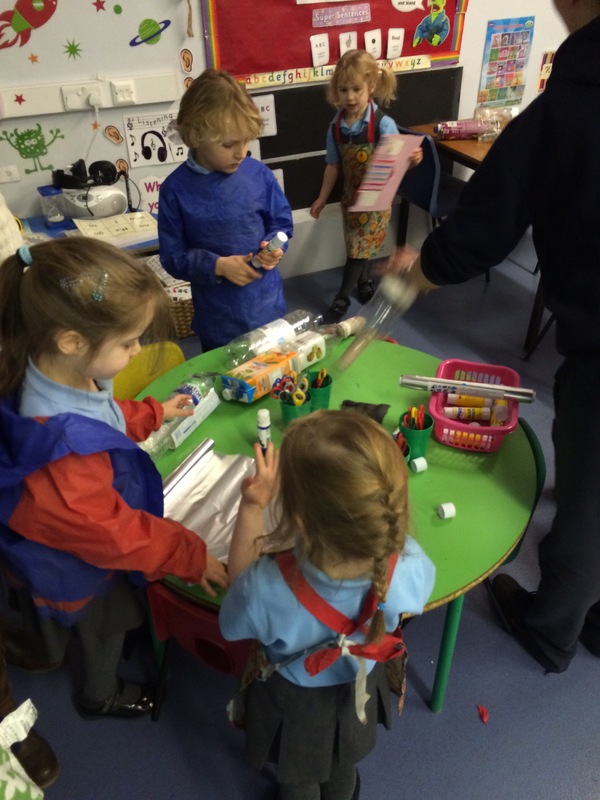 Miss Irwin suggests these might be useful for us to have. 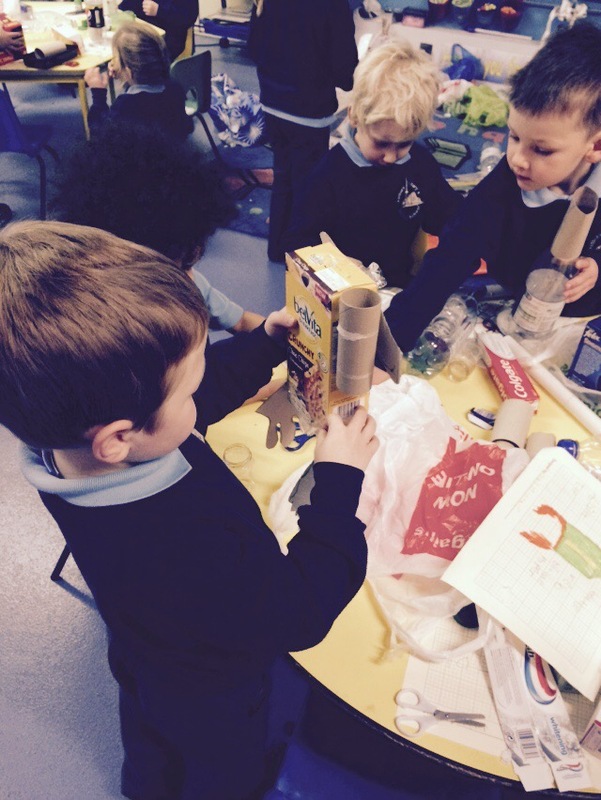 Other materials that might useful could be bottle tops, cardboards and foil. 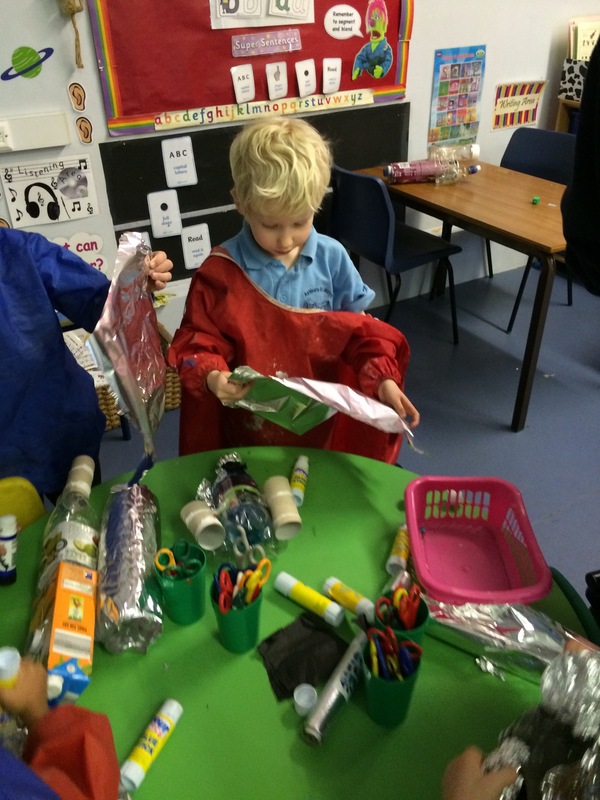 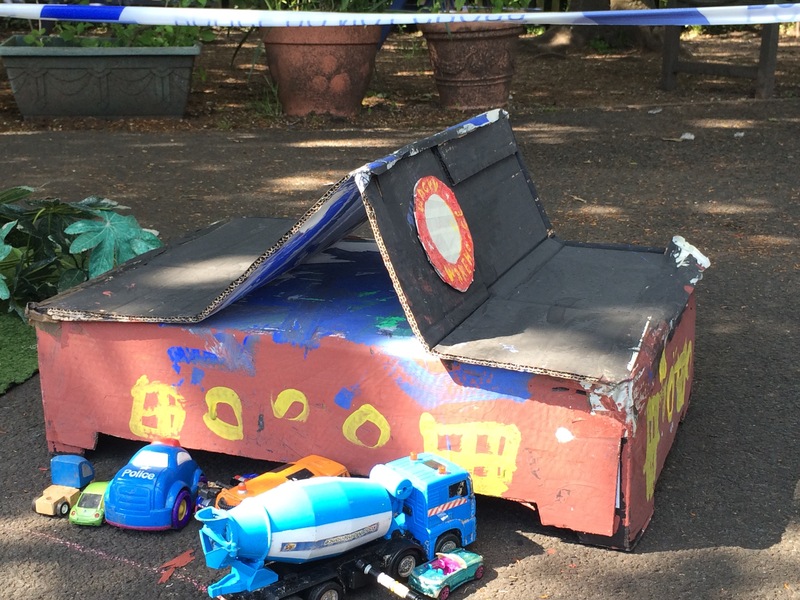 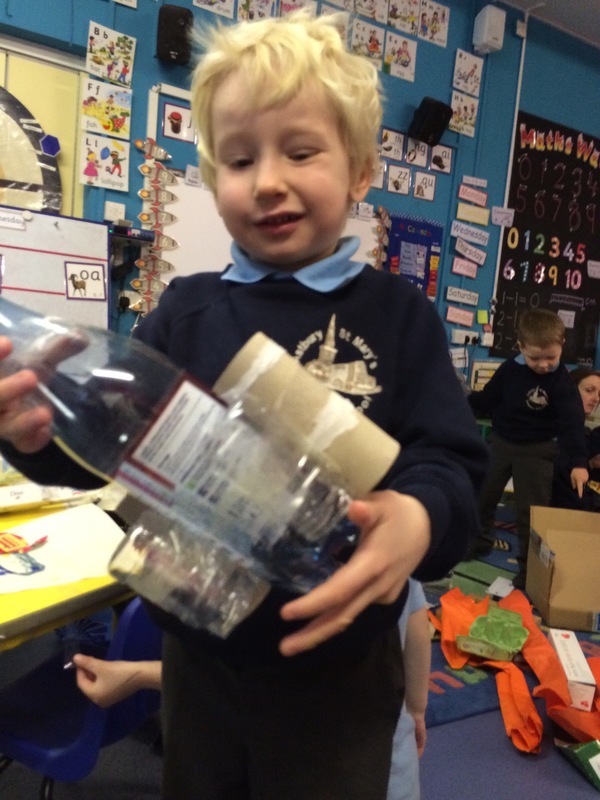 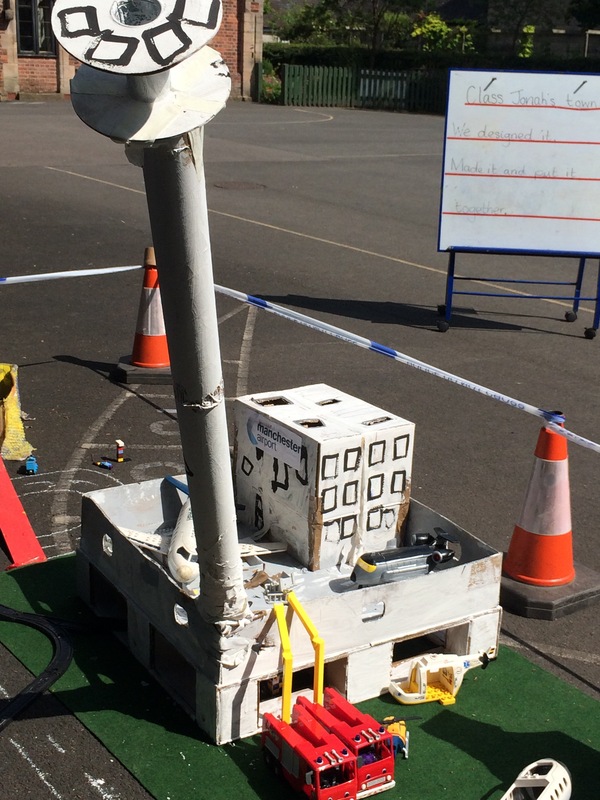 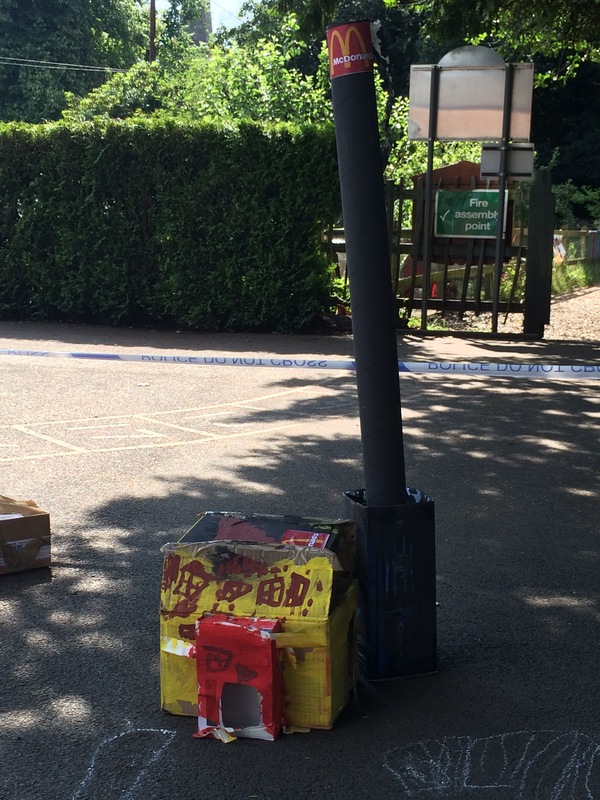 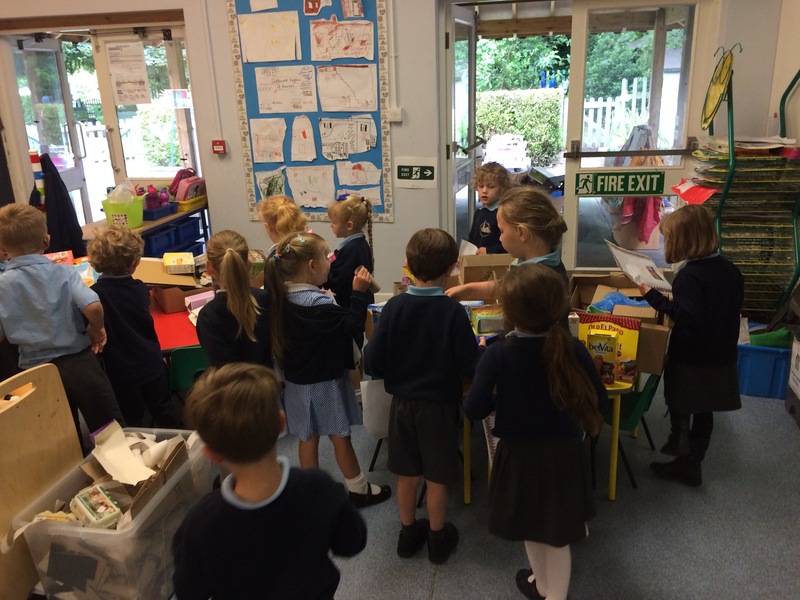 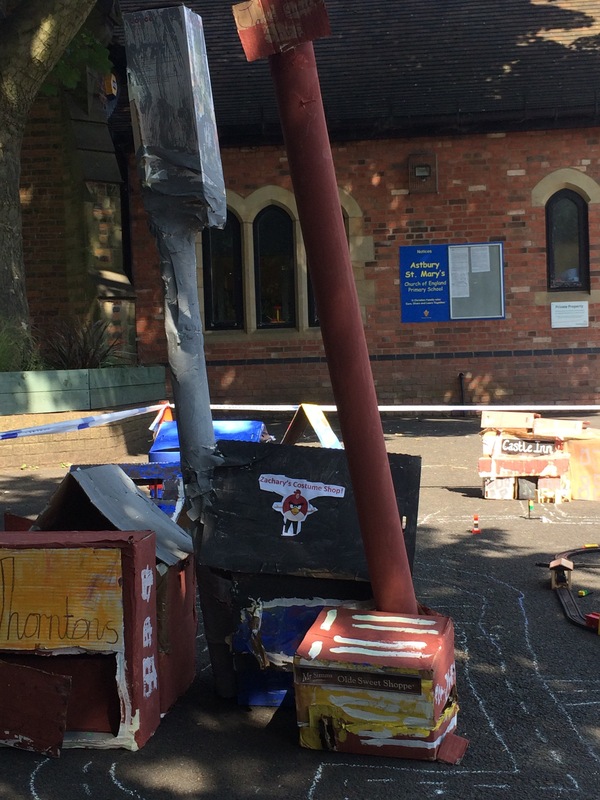 Please bring in all our materials on Rocket making day.